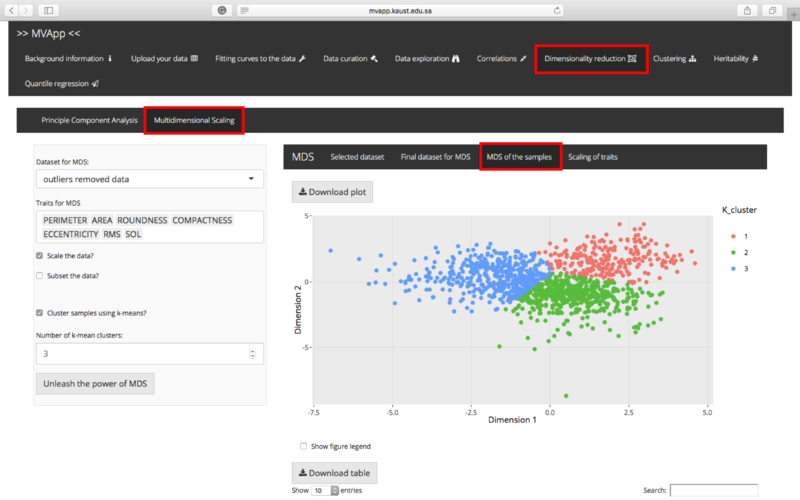 MVApp | Glittery data analysis and multi-variate analysis for all kinds of beautiful, big and small data sets. But remember - rubbish in = rubbish out! 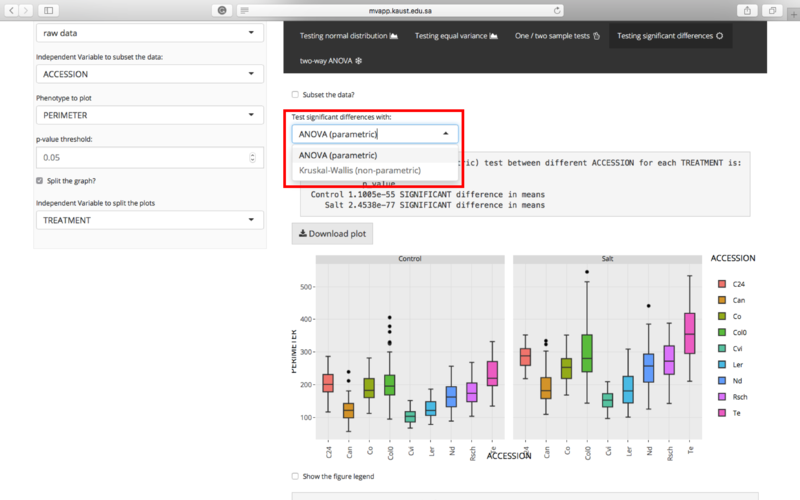 Glittery data analysis and multi-variate analysis for all kinds of beautiful, big and small data sets. But remember - rubbish in = rubbish out! 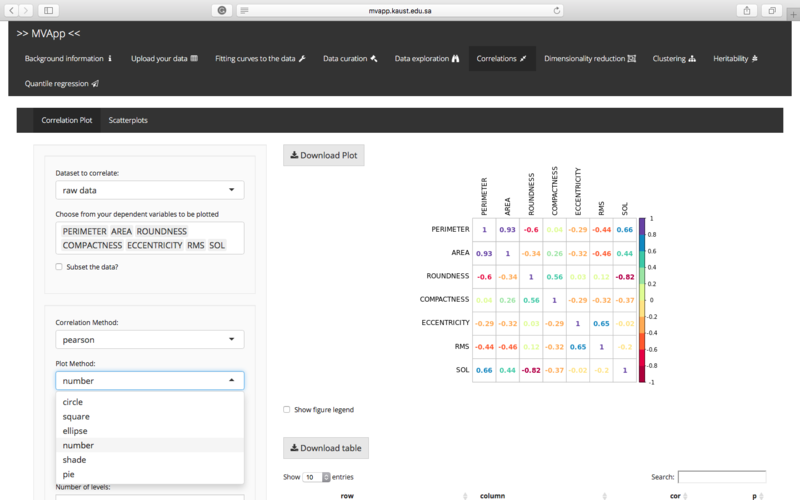 Glittery multivariate analysis platform for all kinds of data. Follow us on twitter @MVApp007. Purpose statement - What is MVApp for? MVApp was created to streamline data analysis for all kinds of biological queries - from investigating mutant phenotypes, examing the effects of an experimental treatment, to studying natural variation using any biological system. We believe that MVApp will enhance data transparency and standardize data curation and analysis in the scientific community by empowering researchers to perform complex analyses without extensive knowledge of R or statistics, as well as improve the data analysis literacy in wider scientific community. Although the MVApp development team is buried armpit-deep in Plant Science, we are trying to make the App as applicable as possible for all biological disciplines and beyond. If you have any suggestions on other types of analyses we can include, please check out our guidelines on how to contribute. You can read the instructions below, or watch one of our video-tutorials on youtube. 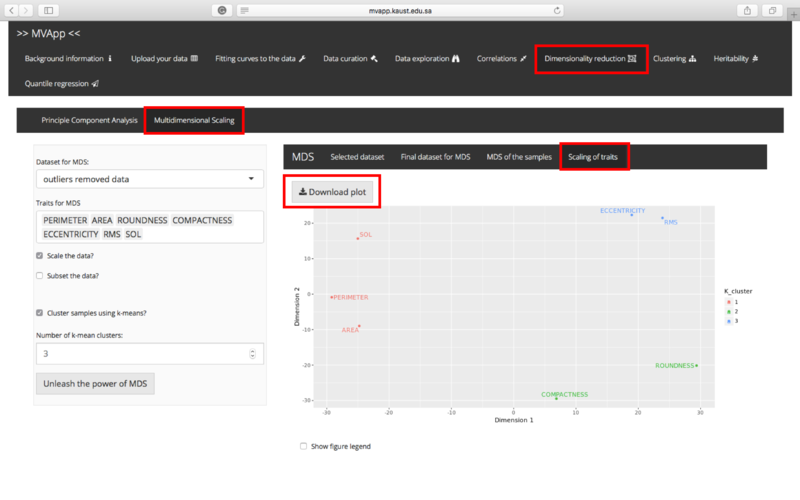 The app is not published yet, but you can find the pre-print version of the MVApp manuscript on figshare: Julkowska, Magdalena; Saade, Stephanie; Agarwal, Gaurav; Gao, Ge; Pailles, Yveline; Morton, Mitchell; Awlia, Mariam; Tester, Mark (2018): MVAPP – Multivariate analysis application for streamlined data analysis and curation. figshare. Paper. 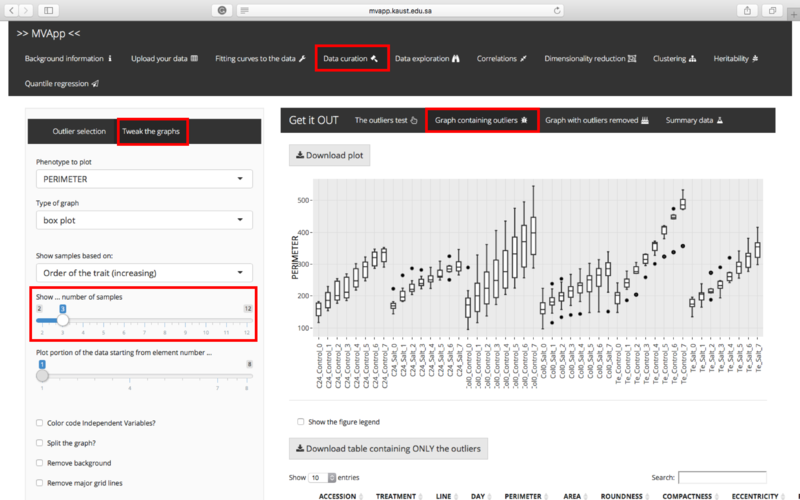 Finally, click on the “Click to set the data” button to finalise data upload with selected columns and annotations (unselected columns from the original dataset will be dropped at this point). Any environment where plants are grown is susceptible to spatial variation resulting in e.g. light, temperature and humidity gradients. These can affect the growth of the plants, and thus have an effect on the obtained results. While we encourage the experimental designs which will minimize the effect of spatial variation, we also allow to test the spatial variation effects on the individual data. At the moment MVApp does not include specific models to correct for spatial variation, as these require advanced statistical insight and commercial R-packages which we cannot provide in a reliable way. Nevertheless, we are happy to recieve contributions from the community. If you have a continuous Independent Variable in your experiment, you might want to estimate how your Dependent Variables change across it. For example, you could investigate the dynamics of plant/bacterial growth over time, or the dose dependency of a phenotypic response to a chemical treatment. Fitting curves will allow you to observe and model these response dynamics. At the moment, MVApp helps you to fit simple functions: linear, quadratic, exponential and square root functions. 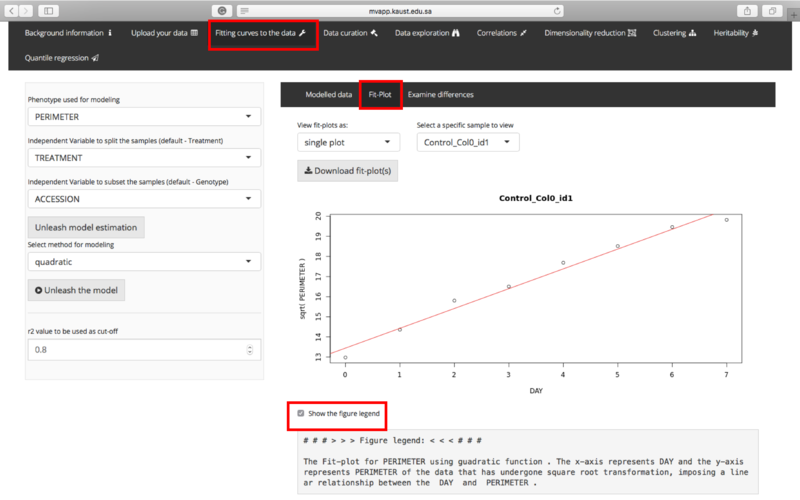 For these functions, we fit a linear model (using lm() function) between the continuous Independent Variable indicated in the “Time” column and the Dependent Variable (phenotype). MVApp extracts the model parameters: y-intercept (“INTERCEPT”) and the first regression coefficient (“DELTA”), as well as the r2 values to determine model performance. 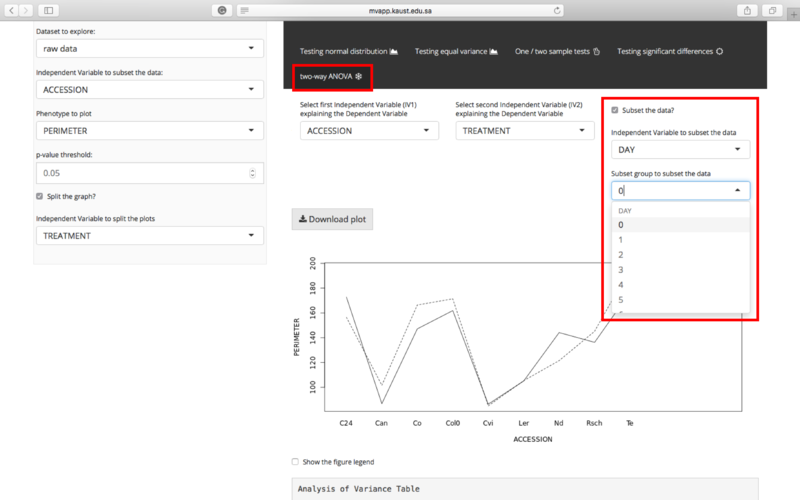 First, in the side panel, select which the Independent Variable(s) you wish to group your samples by, and which Dependent Variable you would like to model. Finally, you can compare how the calculated DELTAs or Coefficients extracted from the models differ between your genotypes and other Independent Variables, such as “treatment”. If your data shows signs of complex dynamics across your continuous Independent Variable (often particularly applicable for long time-series), you might consider fitting a polynomial curve. The splines usually have very high r2 values, and are therefore not included in the “model estimation” for the best fitting curves. For the cubic splines, we use lm(phenotype ~ bs(time, knots=X)) function in R, where you can indicate the position of a knot in the “timepoint to split the cubic spline” box. The fit-plots for the cubic splines carry a dashed diagonal line at the knot position. For the smoothed splines, we use smooth.spline() function in R, and you can select between between automatic or user-defined degrees of freedom. 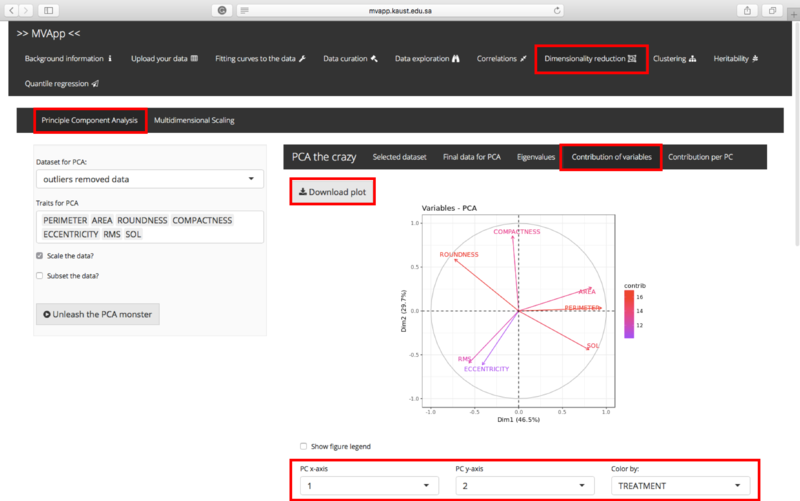 The user-defined degrees of freedom can be selected with the “Number of degrees of freedom” slider. The fitplots for the smoothed splines are represented with the purple lines. In case you choose to fit smoothed splines with automatically determined degrees of freedom, they will be displayed in the last column of the table in the sub-tab “Modelled data”. Please be aware that the degree of freedom might differ between individual samples. Although the polynomial functions commonly have better fit than the simple functions, like linear, quadratic or exponential ones, they often result in more coefficients describing the dynamics. So if you would like to use curve-fitting for simplifying your data, using polynomial functions might not be the best choice. For those familiar with large(ish) scale experiments, you probably had to curate your data, removing outlier samples that stem from experimental errors or even human mistakes while recording data to avoid making spurious conclusions based on unrepresentative data. You likely identified these “weird” samples by simple graphical means, or based on their distance from the median in terms of the Standard Deviation or the Interquartile Range. MVApp helps to automatically highlight potential outliers based on a single or multiple Dependent Variables, using various approaches. 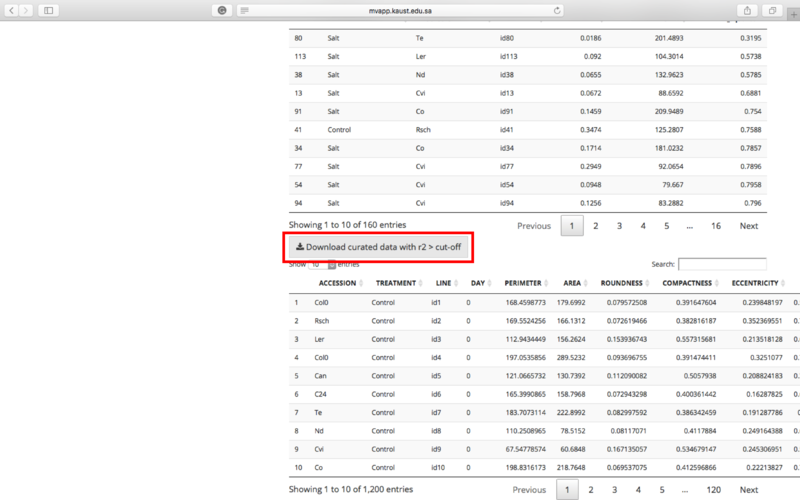 However, be careful, outliers should not be automatically removed. It is good practice to justify outlier samples, perhaps refering to notes or images taken during the experiment that might explain the unusual result. It is possible that a “potential outlier” is in fact a valuable, if extreme, result. 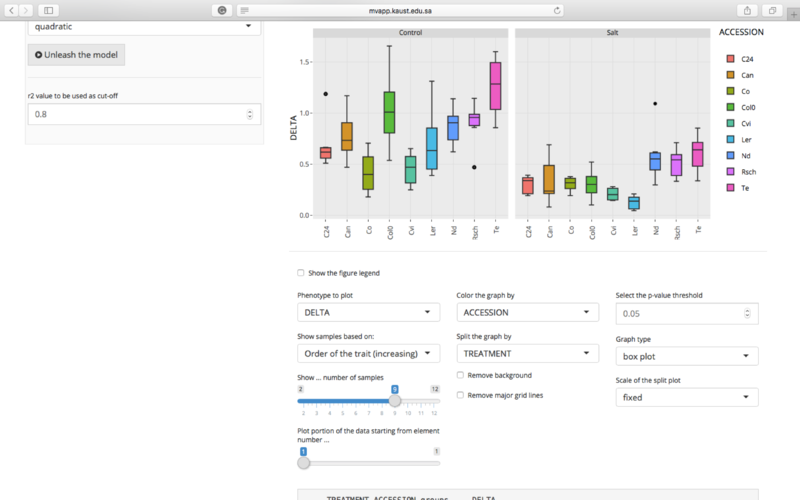 1.5x Interquartile Range: this is the most commonly used method and is visually very appealing, as potential outliers will be identified on the boxplot as “dots” outside of the whiskers. Cook’s distance: this algorithm is actually used to determine the most influential points - meaning the points that could make the most difference in the correlation tests and such. However, if the sample is considered to be “influential” in the majority of traits, it might be worthwhile to check whether everything is OK with it. 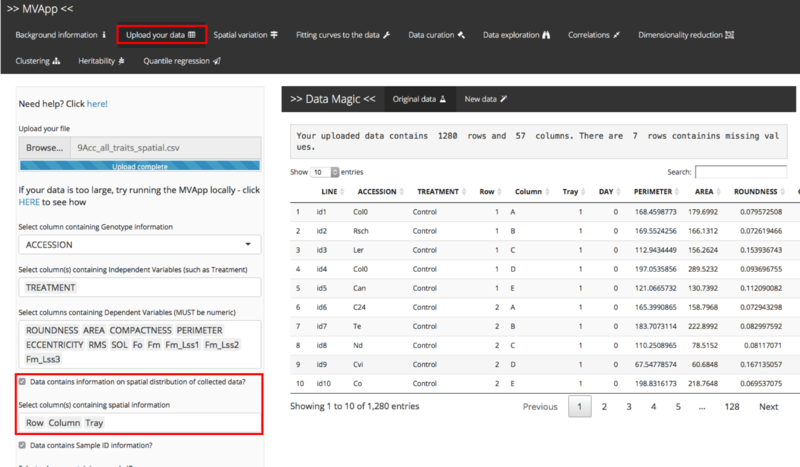 If you decided to select outliers based on all Dependent Variables (remove the entire column), and not replace them by NA (empty cells), use the slider input in the side panel to select the number of Dependent Variables a given sample must be an outlier in order to be considered an outlier across the whole experiment, i.e. the samples that are extreme across many phenotypes and thus should be removed from the data analysis. As you slide the slider, the number of the outliers in the message box will change. 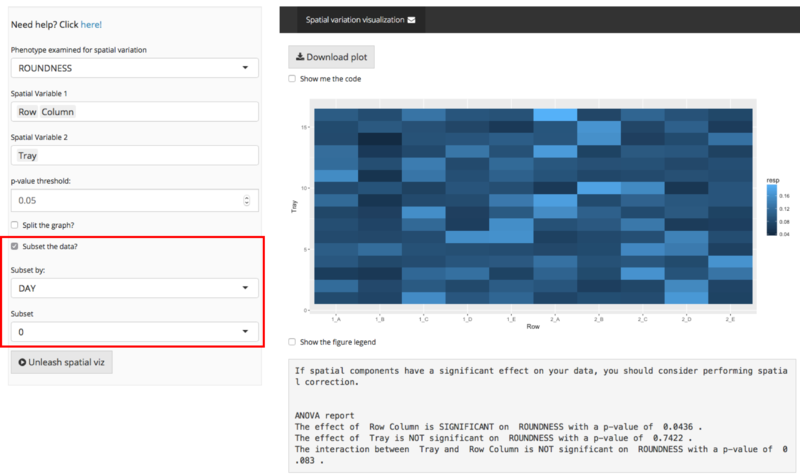 After highlighting potential outliers in your data, you can look at how the data looks with and without them. 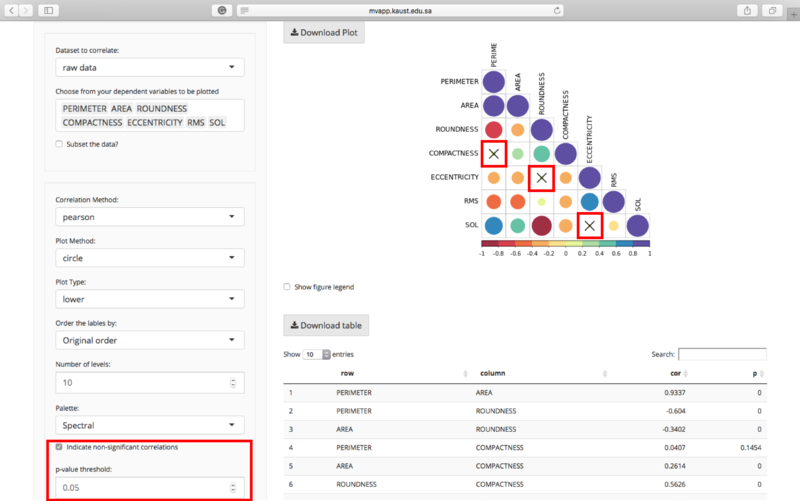 Go to sidepanel sub-tab “Tweak the graphs” and select the Dependent Variable you wish to examine. 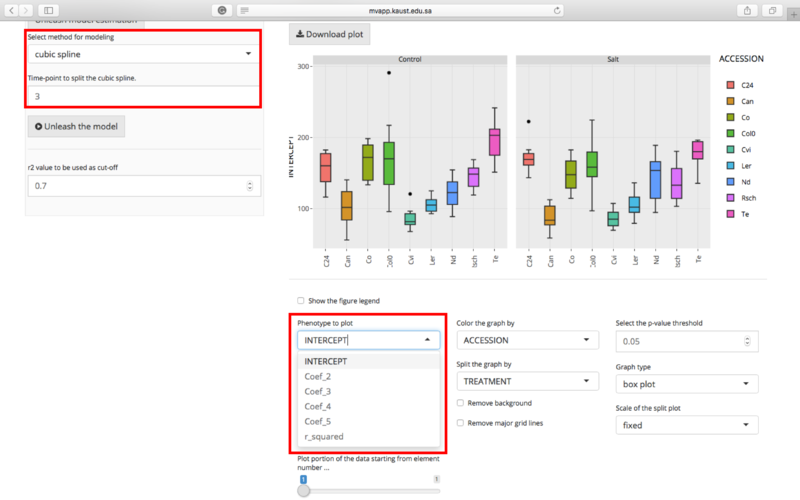 You can also select the type of plot you would like: box plot, scatter plot or bar plot (we find box plots to be the most informative). 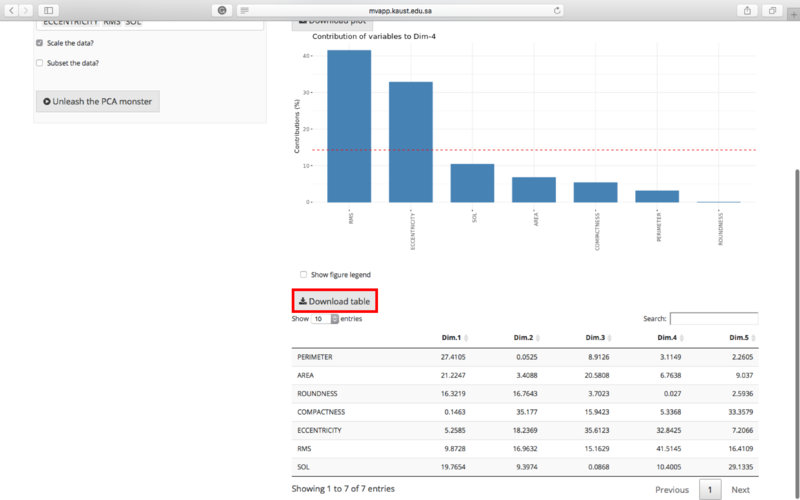 Click on the main panel sub-tab “Graph containing outliers” to see your plots prior to removing potential outliers. If you want to look at the graphs with potential outliers removed (as highlighted in main panel “The outliers test”), click on the main panel “Graphs with outliers removed”. 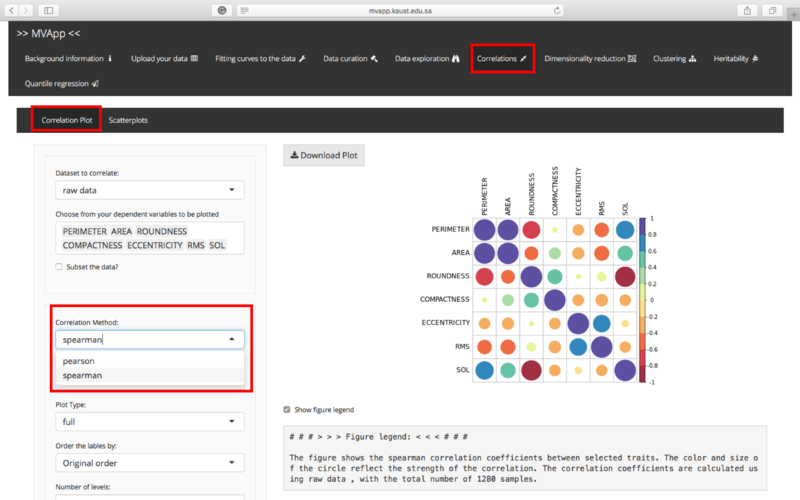 You can click between “Graph containing outliers” and “Graph with outliers removed” to compare both datasets. IMPORTANT NOTE: This outlier test was developed to facilitate data curation. 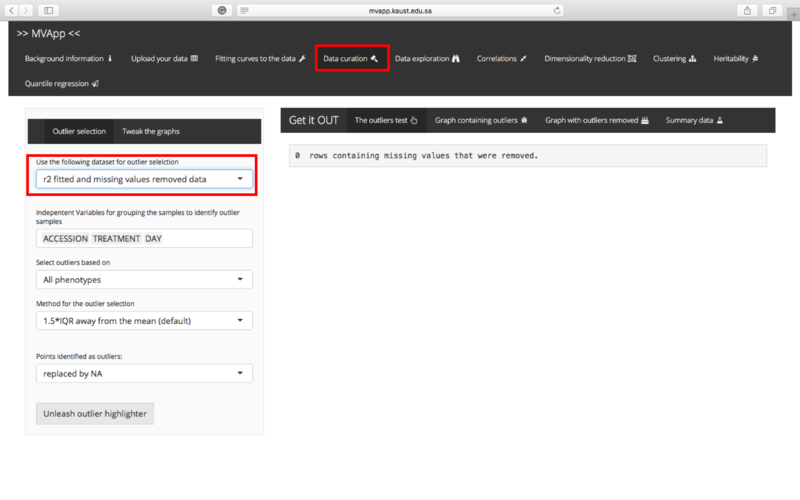 Please do NOT remove any data before making absolutely sure that there is a very good reason that the sample is not representative. 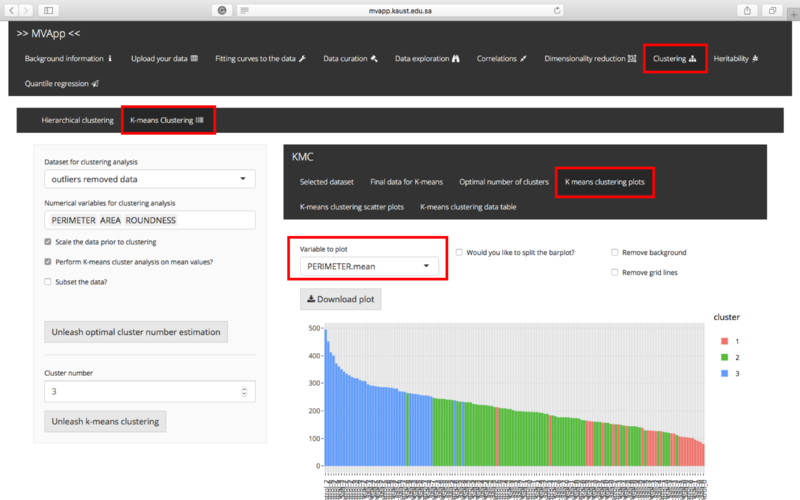 We recommend downloading the dataset with outliers highlighted, manually removing samples that you can reasonably explain, and reuploading the curated dataset before continuing with your analysis. 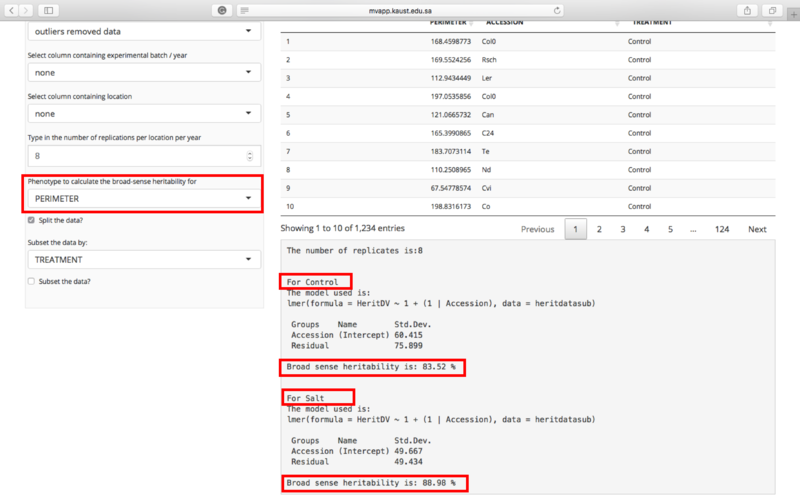 MVApp can calculate summary statistics functions (e.g. 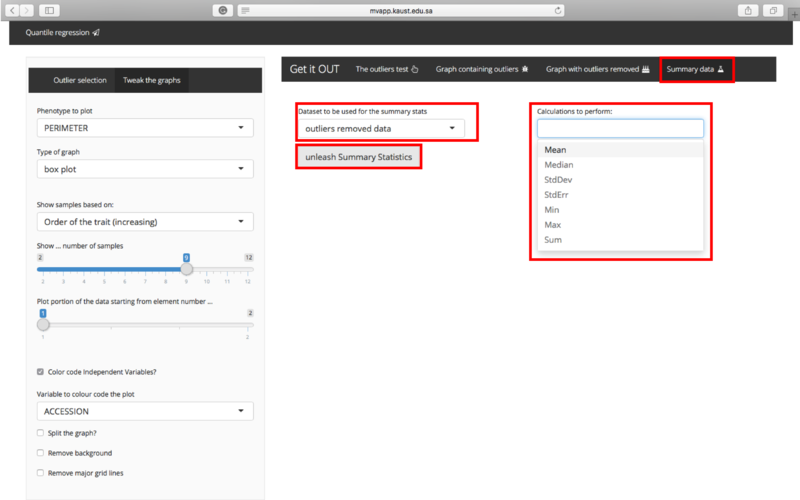 mean, median, standard deviation) in the main panel sub-tab “Summary data”. Once your data is nice and clean and ready to go, it is time to start having a proper look at it. 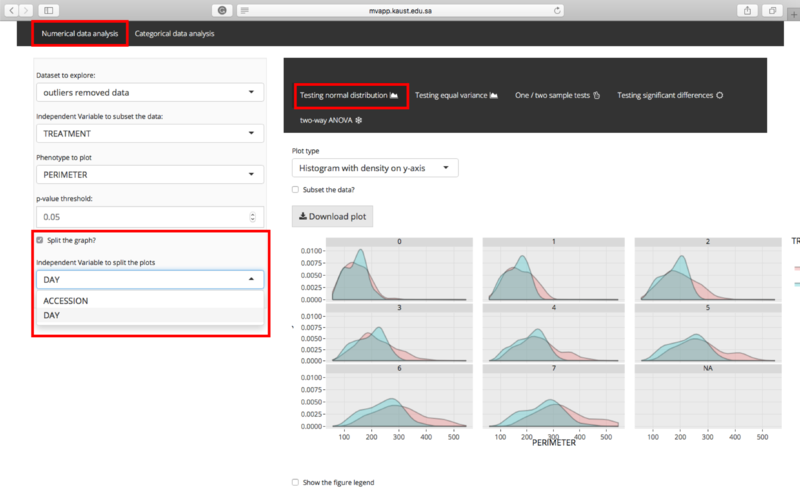 A good place to start is to check out how your data is distributed using histograms and boxplots, grouping samples according to your various Independent Variables. 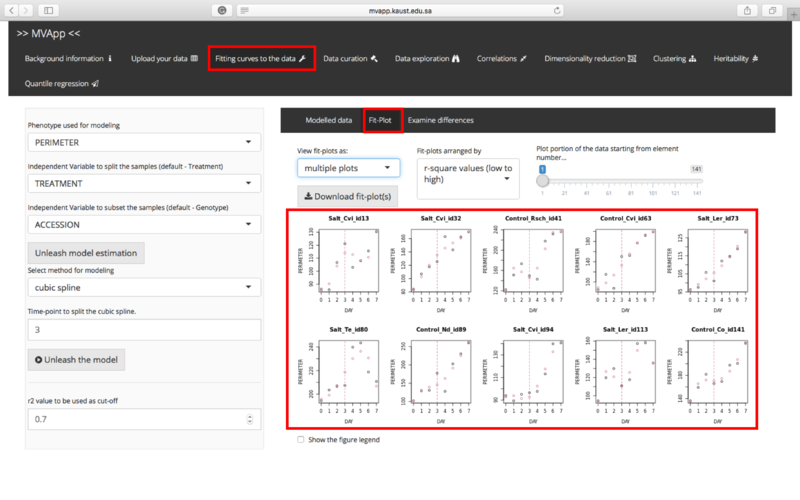 From these you can get an idea of how your different genotypes are behaving, how your treatments are affecting your phenotypes, and how variable your data is. 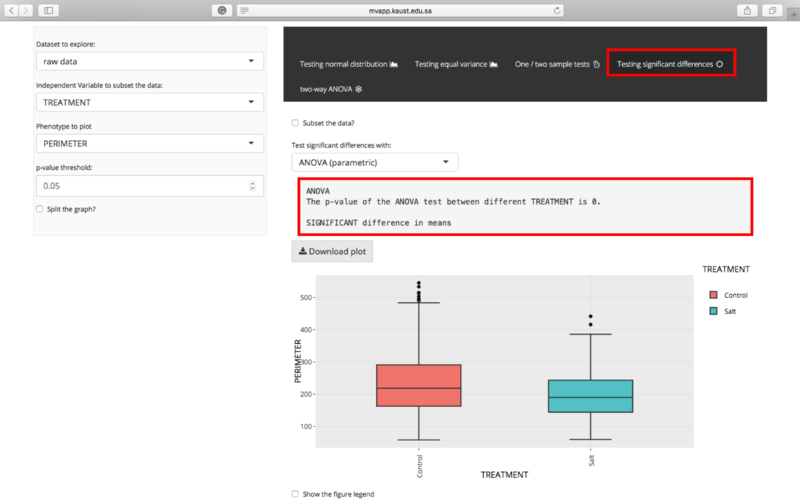 Beyond eyeballing, you can apply statistical tests such as ANOVA to test whether there are significant differences between groups. 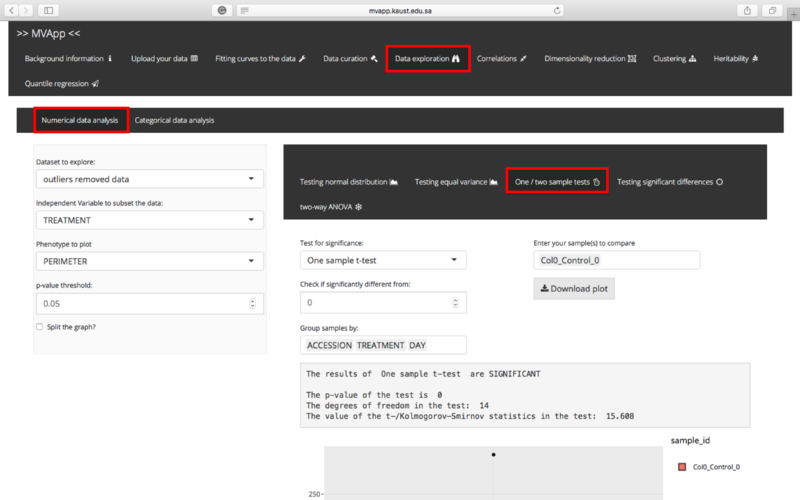 These are all easy things to do in MVApp, which also helps you check the assumptions of these statistical tests, such as normal distribution and homoscedasticity (i.e. equal variance). 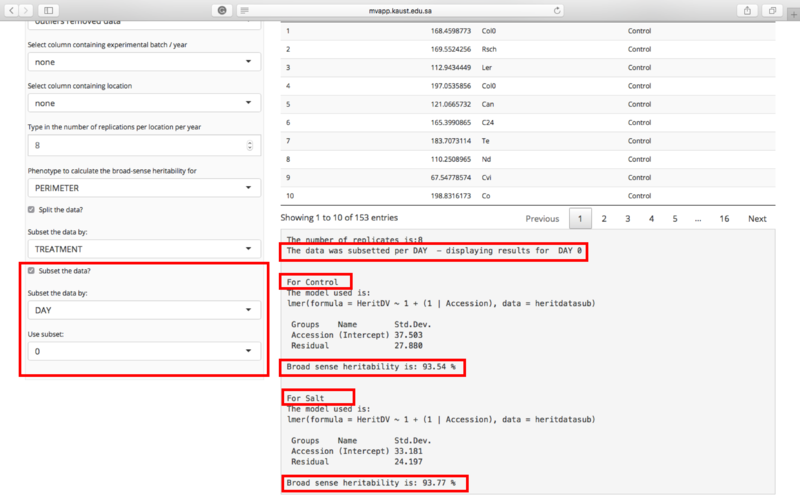 The dataset to be used (raw data, data with missing values removed, or data with outliers removed). The default value is raw data. 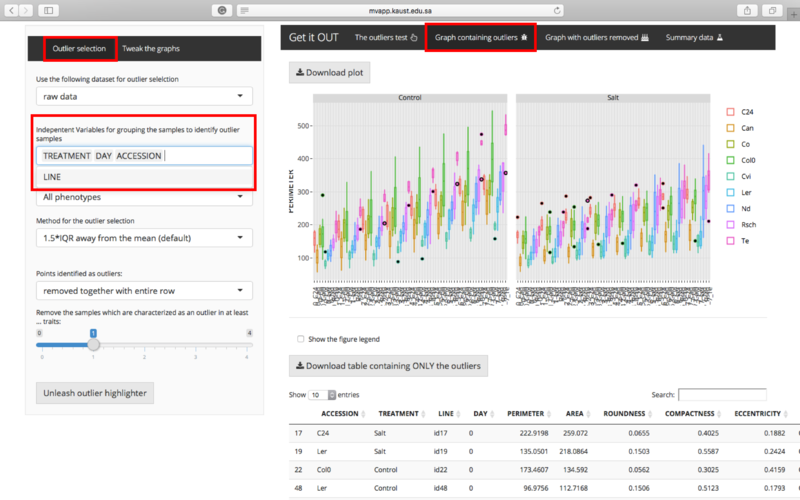 If you did not perform outlier removal or curve fitting, the “outliers removed” and “r2 fitted curves curated data” will not work properly, so please do not select them. If you want to facet your graphs by another Independent Variable, tick the checkbox “Split the graph?” a dropdown menu with a list of independent variables appears. 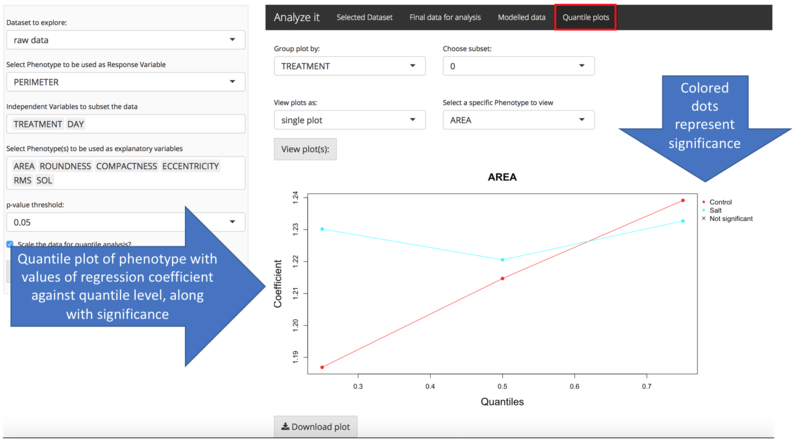 The user can choose the independent variable to split the plot. 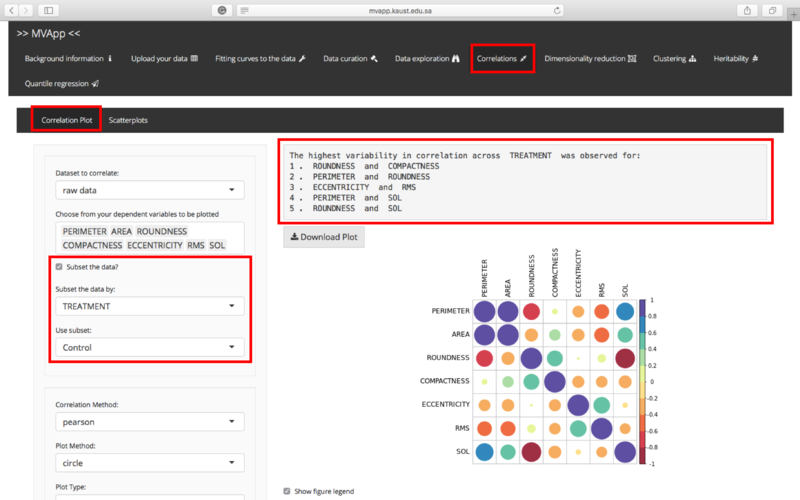 Once the choices are made, the user can proceed to the different tests available in the DATA EXPLORATION tab. 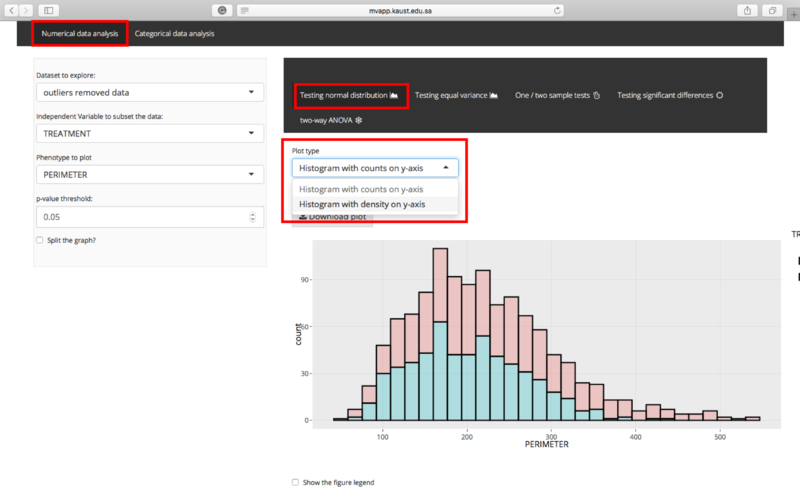 Your histograms will appear in the “Testing normal distribution” sub-tab, where you can choose between “Histograms with counts on y-axis” and “Histograms with density on y-axis”. 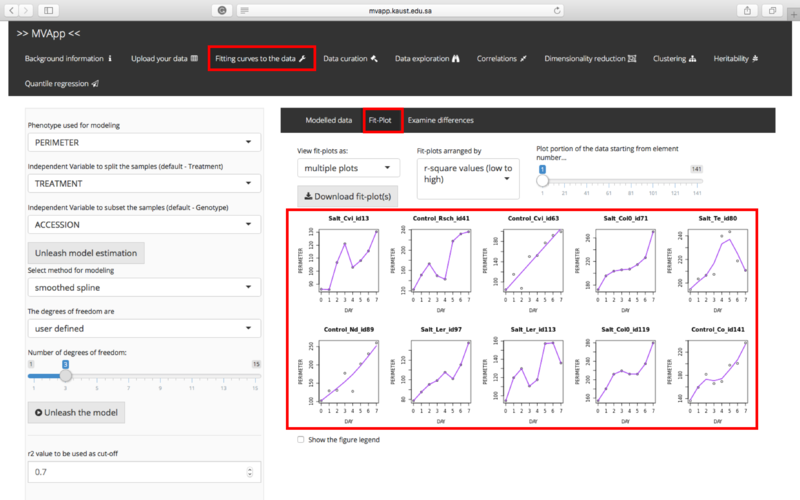 From these plots, you can look at the spread of your data across the Independent Variable groupings selected in the side-panel. 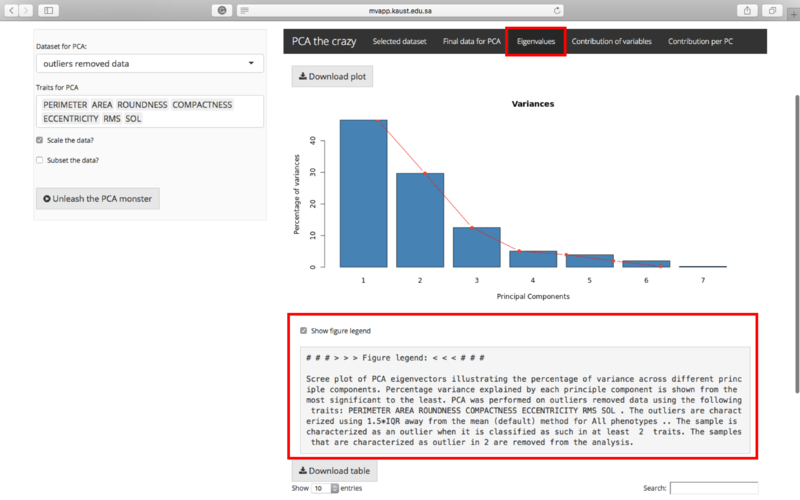 Below the histograms, you will find a message that summarizes the groups/subgroups that seem not to have a normal distribution, where the p-value of the Shapiro-Wilk test is larger than the p-value threshold selected in the side-panel. Normal distribution is a requirement for performing an ANOVA test (less so for large sample sizes). 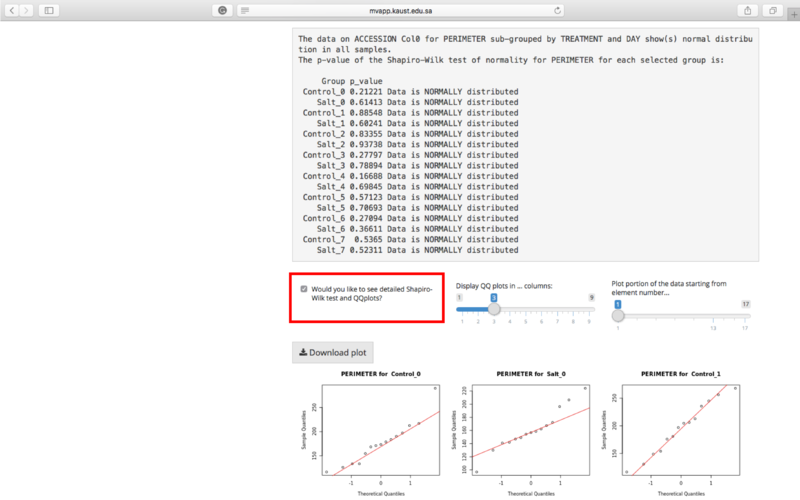 If you want to see the detailed results of the Shapiro-Wilk test for all groups/subgroups along with their QQ-plots, tick the checkbox “See detailed Shapiro-Wilk test and QQ-plots”. The table shows p-value of the Shapiro-Wilk tests performed for each groups/subgroups. If the p-value of the Shapiro-Wilk test for a group is larger than the selected p-value threshold, in the final column the group will be noted with “Data has NORMAL distribution”. Sample size affects the Shapiro-Wilk test and hence (the more the merrier), the user is strongly encouraged to check the QQ-plots. 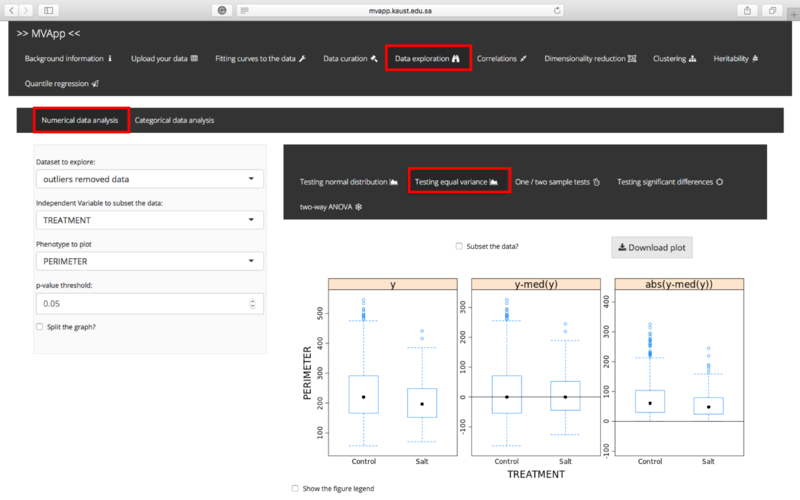 If you ticked the “See detailed Shapiro-Wilk test and QQ-plots?” checkbox, sliders for QQ-plots also appear. These sliders help choose the optimum number of columns and plots for display. The first slider “ Display QQ plots in … columns:” allows the user to choose the number of columns for the display of the QQ-plots. 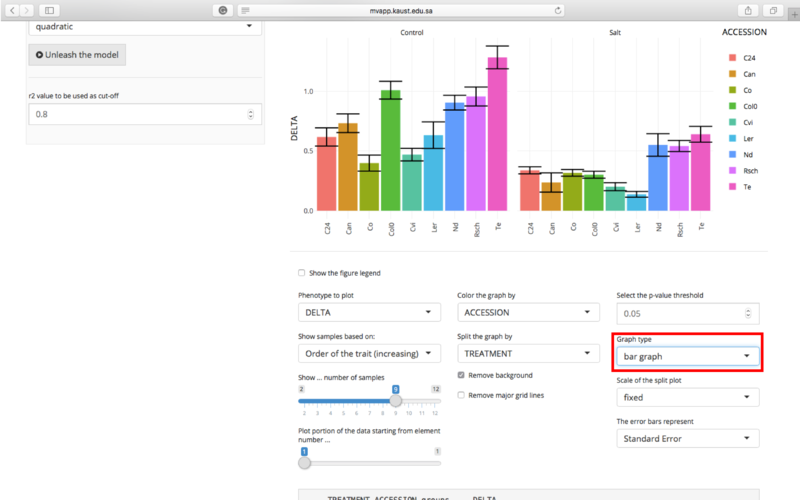 If the number of plots is too large to be displayed all at once in the window, a second slider “Plot portion of the data starting from element number…” appears and the user can choose the portion of plots to be displayed. Based on the results obtained in this sub-tab, you can have a better judgement in the following sub-tab whether to check Bartlett or Levene test for equal variances. In the “Testing equal variance” sub-tab, you can have a look at the results of the Bartlett test and Levene test of equal variances between the different groups and for each sub-groups. Equal variances, or homoscedasticity, is also a requirement for performing an ANOVA test. In the main window, you see the boxplots for each group: left - the observed data (y), middle - the data with the subtracted median (y-med(y)), right - the absolute deviations from the median (abs(y-med(y))). If you scroll lower, you will see the results of both Bartlett and Levene tests. The null hypothesis of the Bartlett and Levene tests assumes that variances across the groups are the same. The Bartlett test is more robust when the data comes from a normal distribution, while Levene test is more robust in case of departures from normality. The first table displays the results of the Bartlett test and the second table displays those of the Levene test. 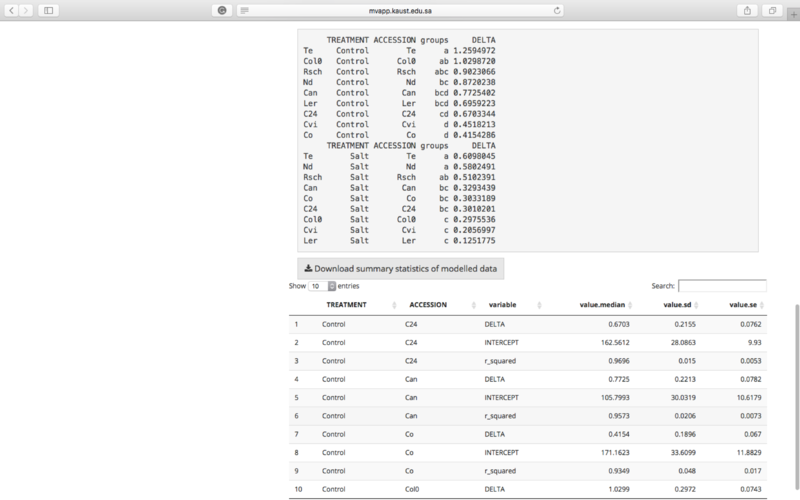 The tables show the p-value of tests performed for each groups/subgroups. If the p-value of the test for a group is larger than the selected p-value threshold, groups are noted as “Equal”. In this case there is not enough evidence to reject the null hypothesis, where the variances are considered equal. If the p-value of the test for a group is smaller than the selected p-value threshold, groups are noted as “Not equal”. In this case, the null hypothesis is rejected and the variances are considered not equal. 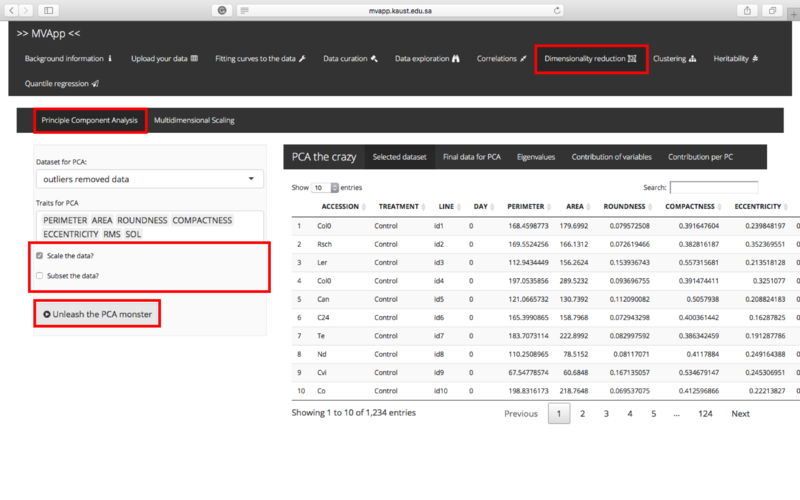 As indicated previously, the results of this sub-tab and the previous sub-tab are needed to for the ANOVA test performed in the following sub-tab. 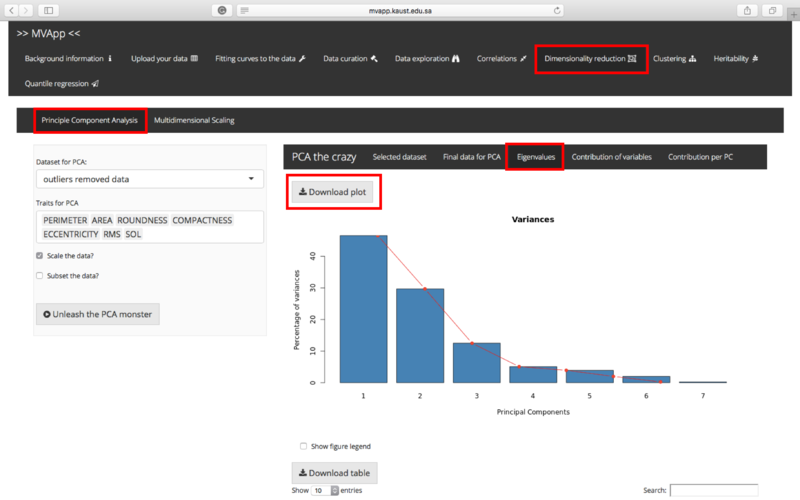 ANOVA assumes the data comes from a normal distribution and the variances are equal. 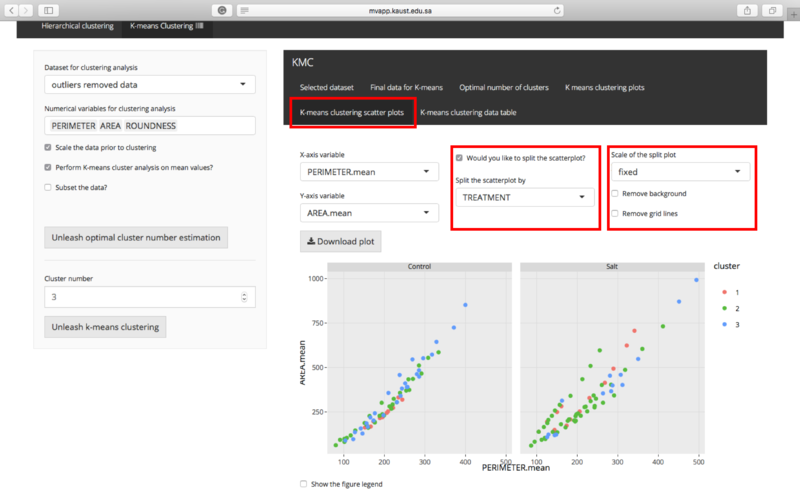 In this subtab you can explore the differences between a certain value and your sample, or between two selected samples, with one/two sample t-test or Kolmogorov-Smirnov test (for non-parametric samples). If the p-value of the ANOVA test for a group is larger than the selected p-value threshold, groups are noted with “NO significant difference in means”. In this case there is not enough evidence to reject the null hypothesis and the means of the groups are assumed equal. If the p-value of the ANOVA test for a group is smaller than the selected p-value threshold, groups are noted with “SIGNIFICANT difference in means”. In this case the null hypothesis, where the means of the group are considered equal, is rejected and the means of the groups can be considered significantly different. A second text box displays the significant groups based on Tukey’s pairwise comparison. Groups that share a common letter do not have significantly different means for the selected Dependent Variable. 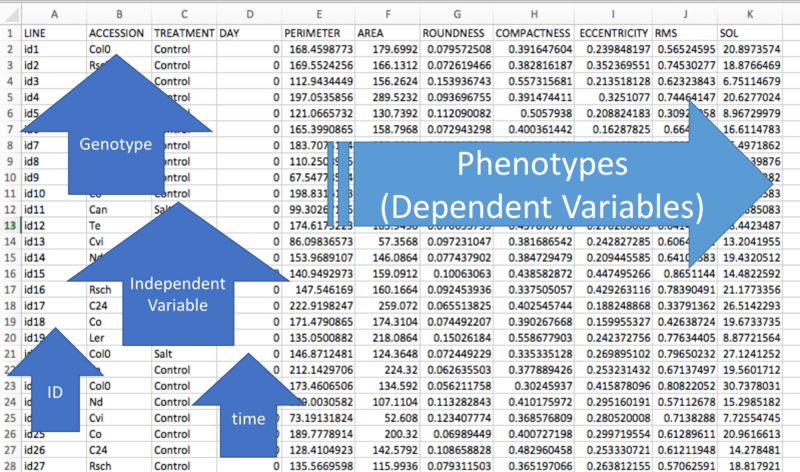 This tab is used to check whether and how strongly your selected dependent variables (phenotypes) are related by creating a correlation matrix of the selected variable pairs. Correlation coefficients and p-values are provided for each variable pair. First of all, select the dataset you would like to use to perform the correlation analysis. If you did not perform outlier removal or curve fitting, the “outliers removed” and “r2 fitted curves curated data” will not work properly, so please do not select them. Note: be aware of the outliers in your selected data. While statistically there’s no harm if the data contains outliers, they can significantly skew the correlation coefficient and make it inaccurate. 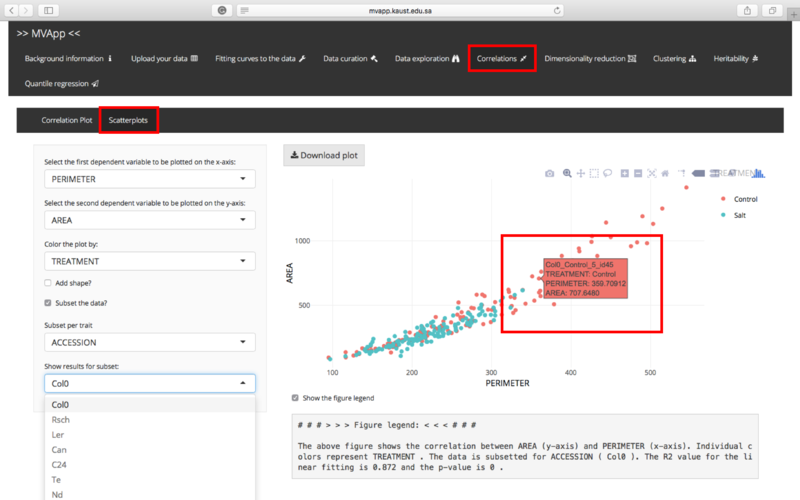 You can spot them visually from the scatterplot or use the outlier removal feature from Data Curation tab and select the outlier removed data for your correlation analysis. 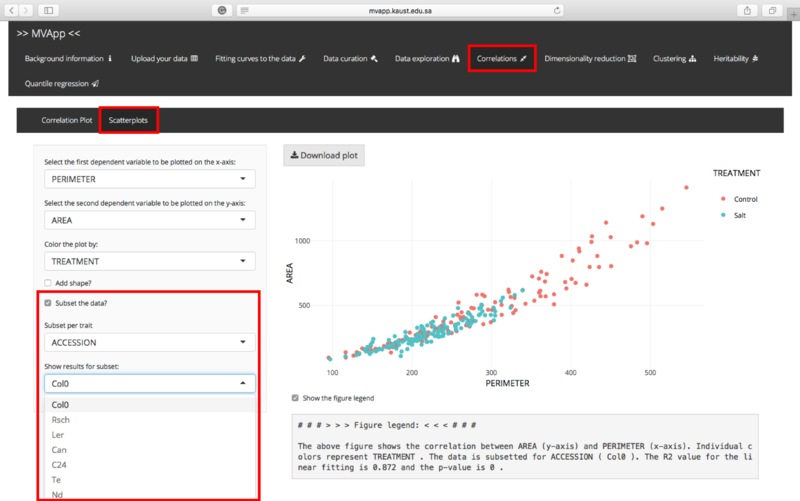 If you want to include / exclude some of the Dependent Variables from your data, you can do so by selecting or deselecting them from the “Choose from Dependent Variables to be plotted” window. There are two methods you can choose from to calculate the correlation coefficients. The default Pearson r correlation is the most widely used correlation statistic to measure the degree of the relationship between linearly related variables. 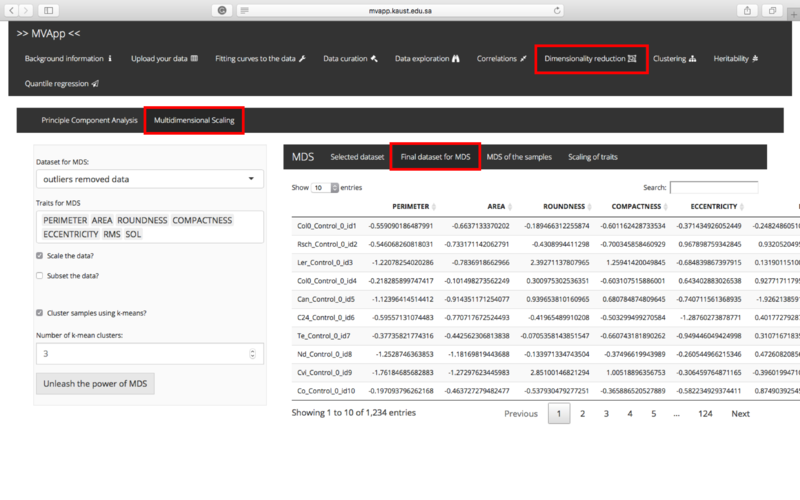 It assumes that your dataset to be correlated approximate the normal distribution and follow a linear relationship. (https://en.wikipedia.org/wiki/Pearson_correlation_coefficient).Alternatively, you can use Spearman correlation which assess statistical associations based on the ranks of the variables instead of the variables themselves, and it does not hold any assumptions about the distributions of your data. Spearman correlation. 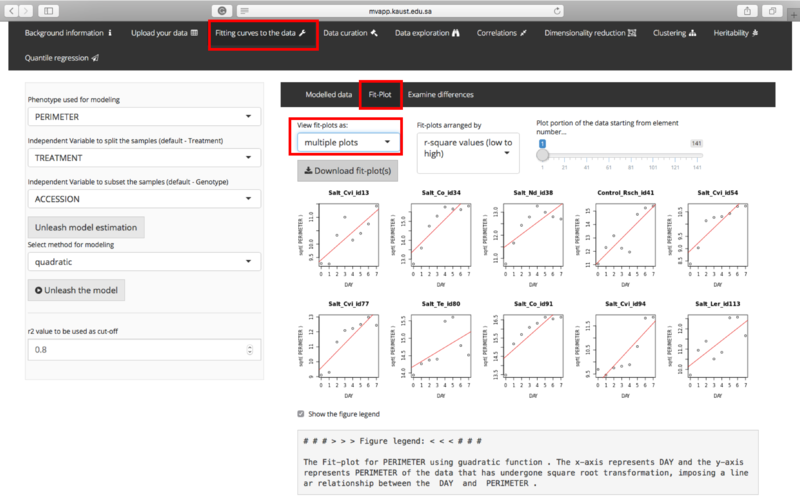 The default is to perform correlation analysis across all dependent variables (phenotypes) across all independent variables. You can also choose to use a subset of your data (for examples, phenotypes under a certain treatment, or from a certain day) to examine the correlation. Principal component analysis (PCA) is often used to simplify data into fewer dimensions and to check which traits explain the majority of the variation found in the population studied. However, PCA is often not explored to its full potential. 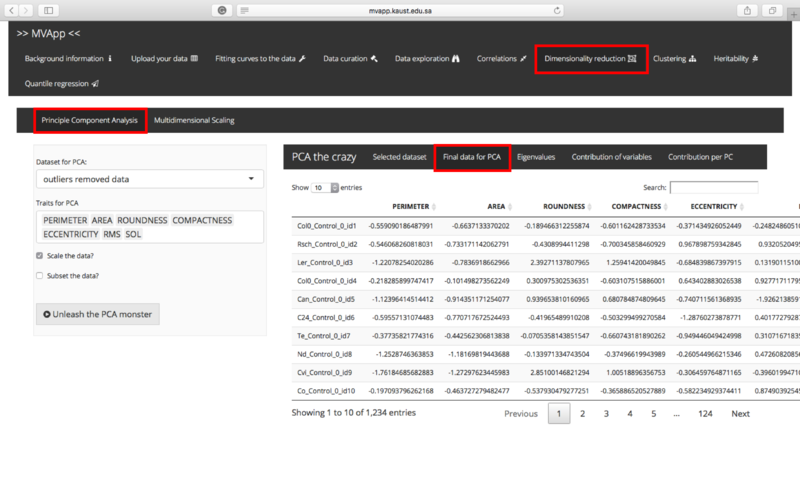 You can, for example, run PCA on data subsetted by an Independent Variable (e.g. 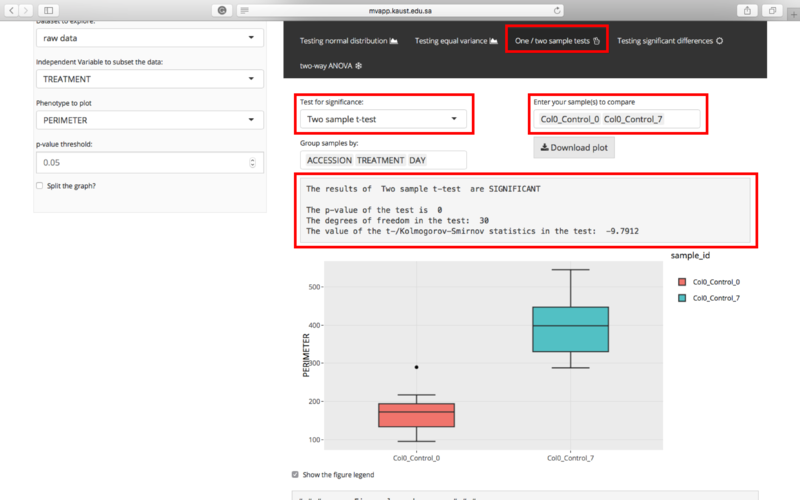 : treatment or a specific timepoint) or run PCA separately on those subsets to see how much each of your Dependent Variables (traits) contribute to explaining the observed variation. MVApp allows you to do all this! 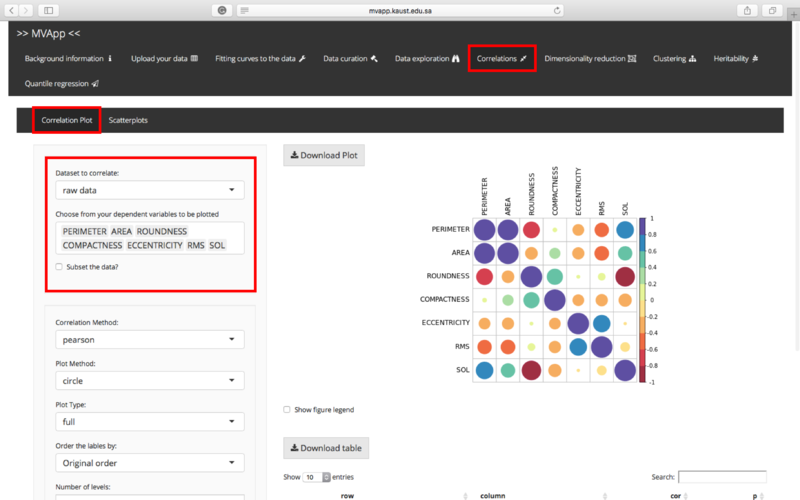 Select the dataset you would like to analyse from the dropdown menu at the top of the side panel. If you have not performed outlier removal or curve fitting, the “outliers removed” and “r2 fitted curves curated data” will not work properly, so please do not select them. 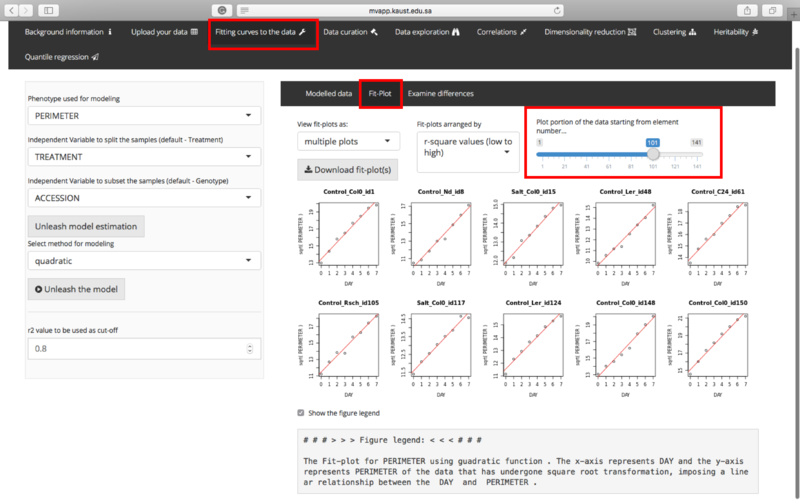 You can additionally select if you would like to scale the data (recommended if the values of individual Dependent Variables are differing in their scale), and run PCA on a specific subset of your data. After selecting all of the above, click “Unleash the PCA monster”. What are the principal component coordinates for individual samples? 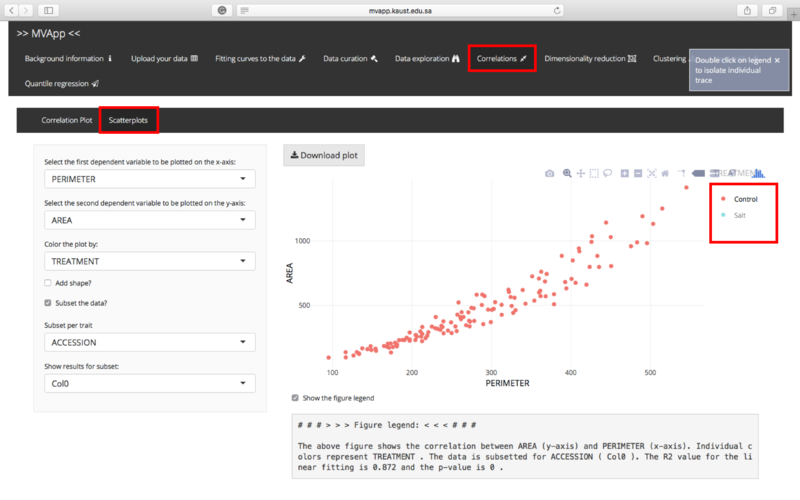 By scrolling down, you can find the PC coordinates of each sample represented as a scatter plot. The x- and y-axis are controlled by the same dropdown menu as the contribution plots. You can color the plot by any of the Independent Variable that you select from the dropdown menu. Multidimensional scaling (MDS) is a multivariate data analysis approach that is used to visualize the similarity/dissimilarity between samples by plotting points in two dimensions. The input data for MDS is a dissimilarity matrix representing the distances among pairs of objects. 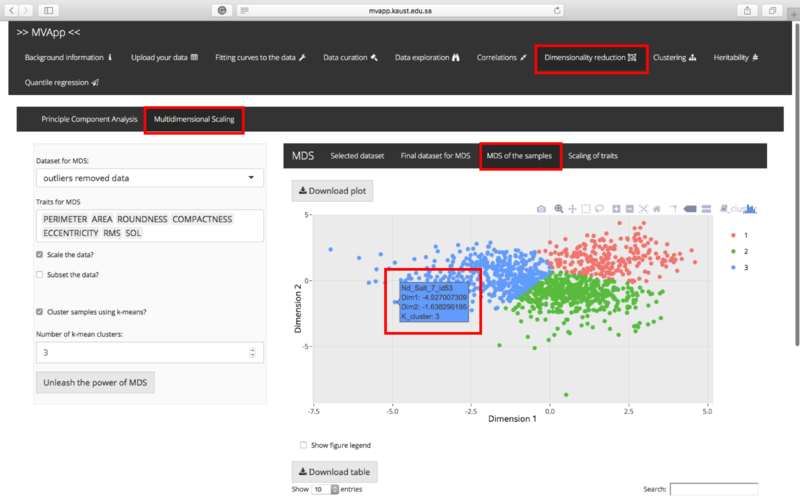 MDS is mathematically and conceptually similar to PCA and factor analysis, but PCA is more focused on the dimensions themselves and seeks to identify the traits that explain the most variance, whereas MDS is more focused on the relationships found between the scaled objects. Select the dataset you would like to analyze from the dropdown menu at the top of the side panel. If you have not performed outlier removal or curve fitting, the “outliers removed” and “r2 fitted curves curated data” will not work properly, so please do not select them. 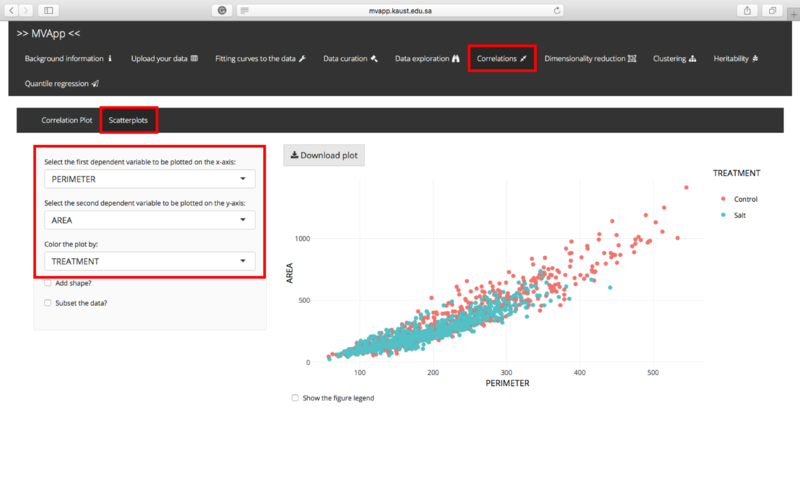 You can additionally select whether you would like to scale the data (recommended if the values of individual Dependent Variables are differing in their scale), and run MDS on a specific subset of your data. If you would like to segregate your scaled samples into a number of clusters, you can select “Cluster samples using k-means” checkbox and choose the number of clusters you would like to use. 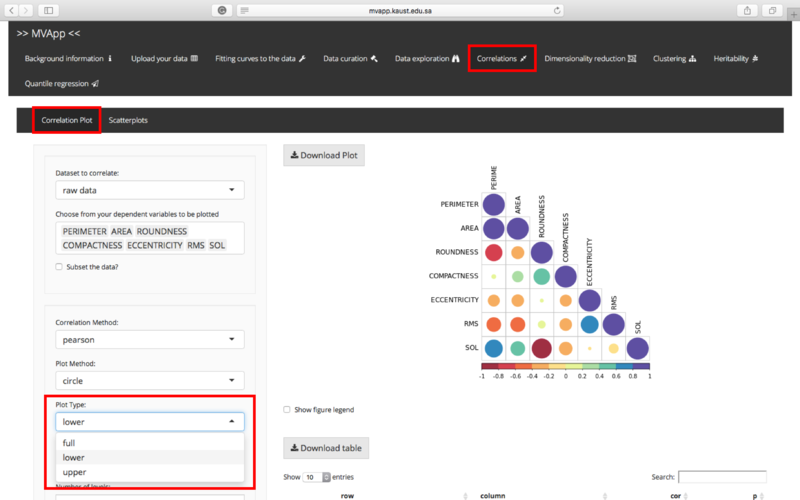 By scrolling with your pointer through the graph, you will find specific information regarding your samples. 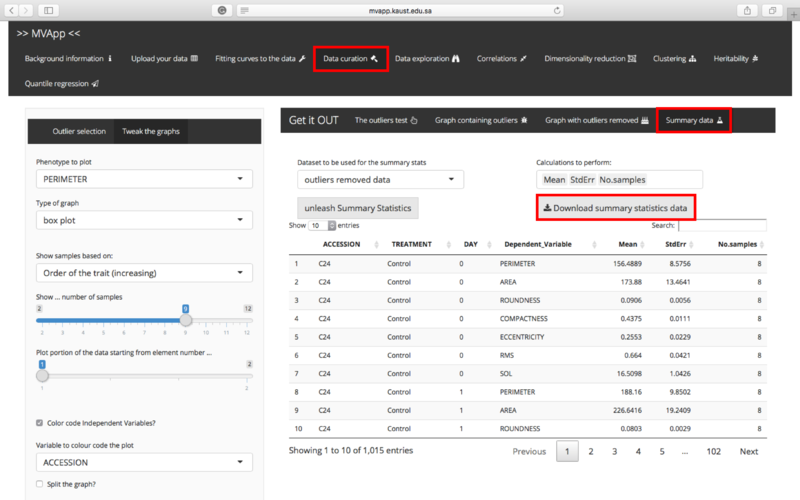 The sample identifier is representing Genotype, Independent Variable, Time/Gradient and Sample ID (selected in “Data upload” tab). If you scroll down, you will see the table summarizing the coordinates of individual samples as calculated with MDS, including the K-means clusters if the option for “k-mean clustering” was chosen. The table can be downloaded as a “.csv” file, by clicking on the “Download table” button. 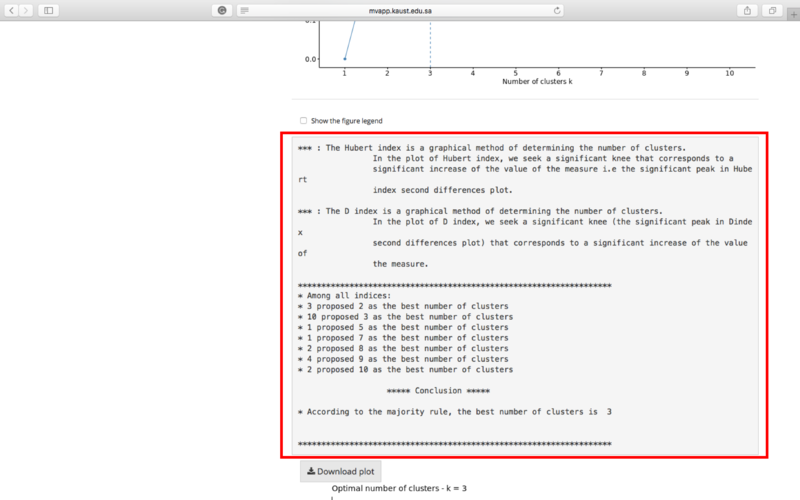 Hierarchical cluster analysis is an algorithmic approach to find discrete groups with varying degrees of (dis)similarity. The samples are hierarchically organised depending on the selected method and may be presented as a dendrogram. Hierarchical clustering is commonly used in discretising largely continuous ecological phenomena to aid structure detection and hypothesis generation. For example, if data were collected along a gradient, cluster analysis may help to identify distinct regions therein which may correspond to an ecologically meaningful grouping. Similarly, the hierarchical cluster analysis can be used in phenotype analysis from the experiment performed with and without stress, and group different genotypes into groups that show similar responses to stress conditions. 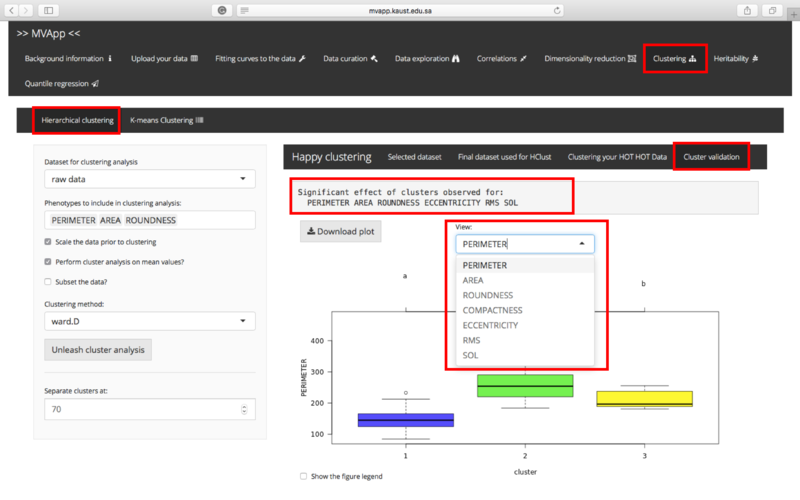 The hierarchical clustering approach was previously used for clustering the Arabidopsis accessions based on their root and shoot responses to salt stress. 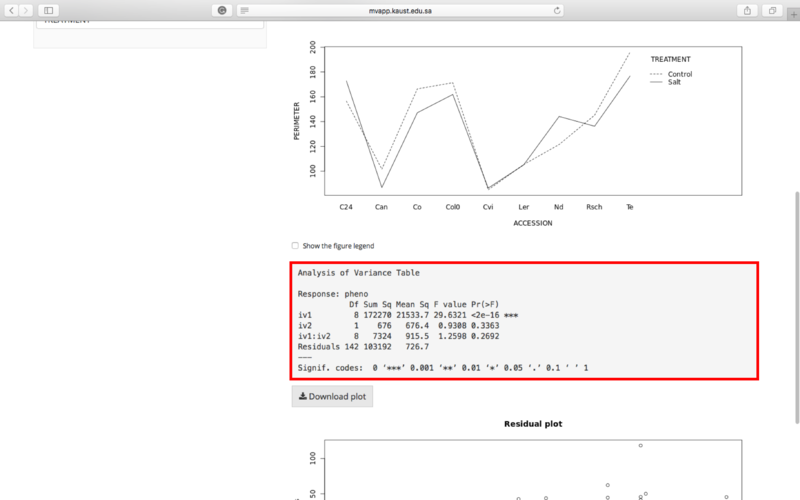 Now you can perform this analysis within minutes on your own data using MVApp. Select the dataset to analyse from the dropdown menu at the top of the side panel. If you did not perform outlier removal or curve fitting, the “outliers removed” and “r2 fitted curves curated data” will not work properly, so please do not select them. 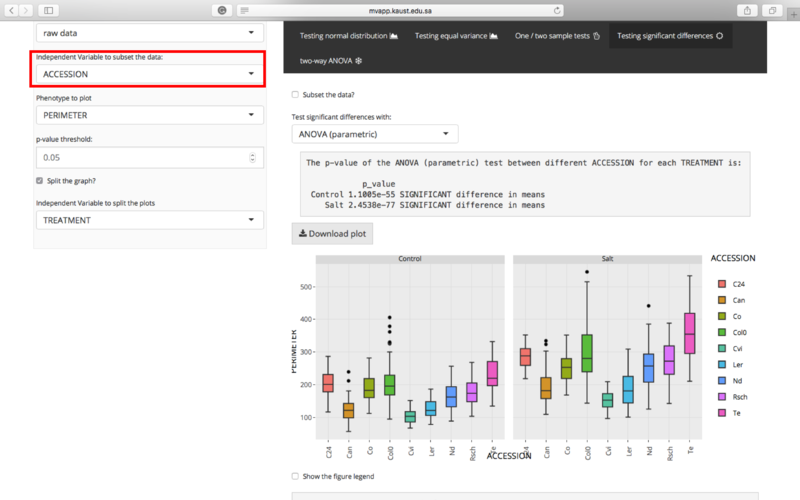 You can additionally select whether you would like to scale the data (recommended if the values of individual dependent variables are differing in their scale), perform the Hierarchical Clustering on the mean data (means are calculated per Genotype, Independent Variable and Time points selected in “Data upload” tab), or run Hierarchical Clustering on a specific subset of your data. At this point you should also select method for clustering the samples. The relationship between the accessions is established depending on the selected dependent variables and the method. 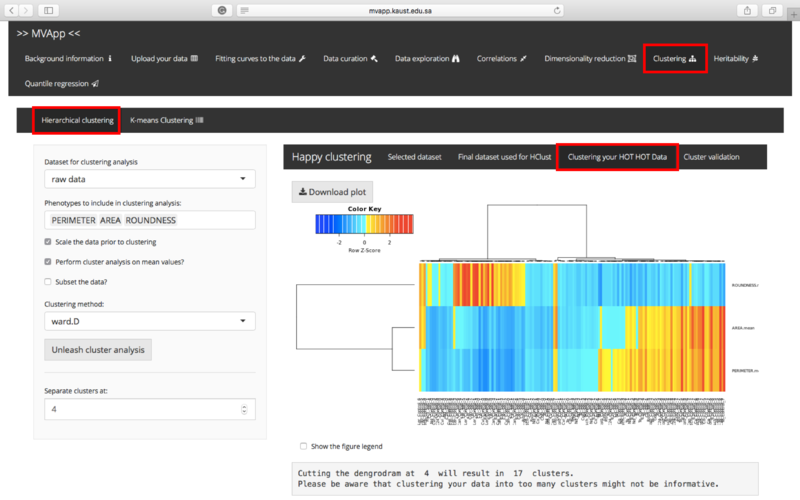 In the sub-tab “Clustering your HOT HOT data” you can view a heatmap of the selected dependent variables displayed as separate rows, while the individual (or mean) values corresponding to individual samples will be displayed in separate columns. 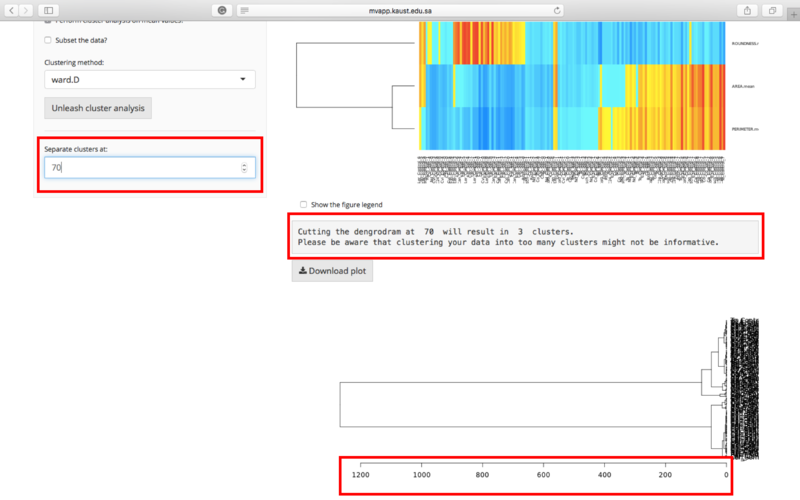 If you scroll down, you will find a dendrogram representing individual samples that are clustered as in the heatmap above, but now you will be able to see the (dis)similarity distance between the samples. 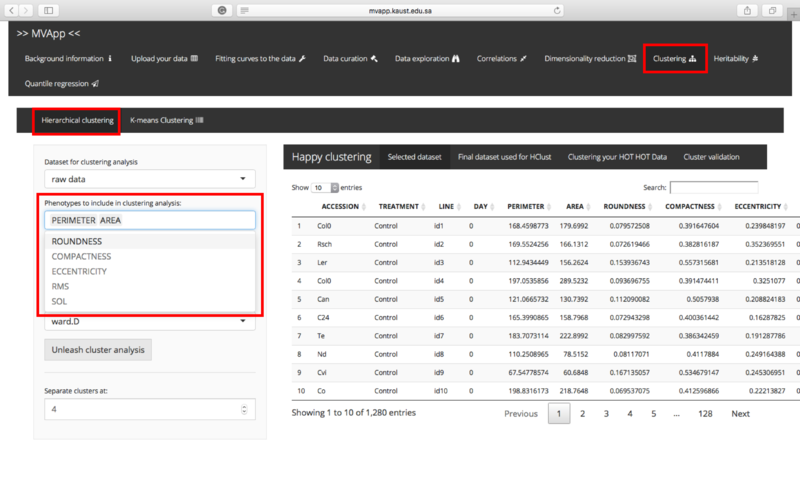 Enter the distance at which you wish to separate the data into the clusters in the window “Separate clusters at:”. 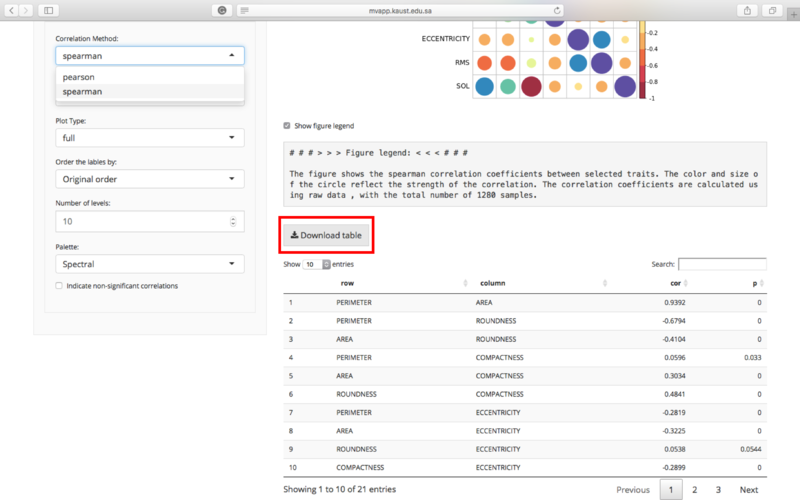 As soon as you enter a value, the message above the dendrogram will change, displaying the number of clusters. 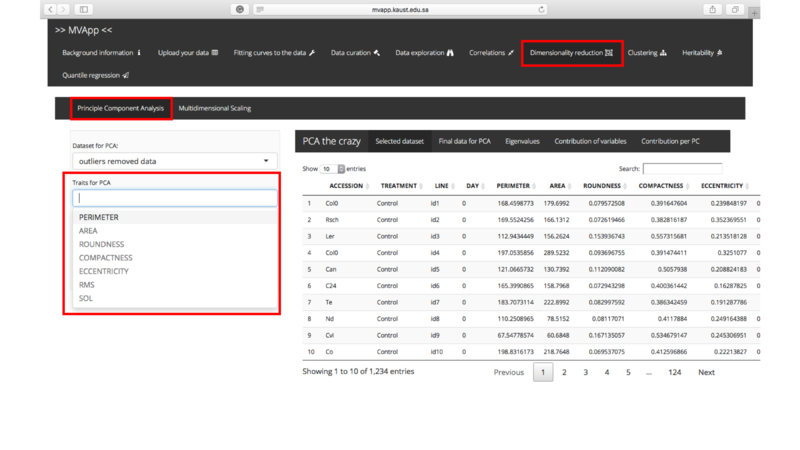 Please be aware that having too many clusters might not be informative and will significantly slow, or even crash, the cluster validation step. 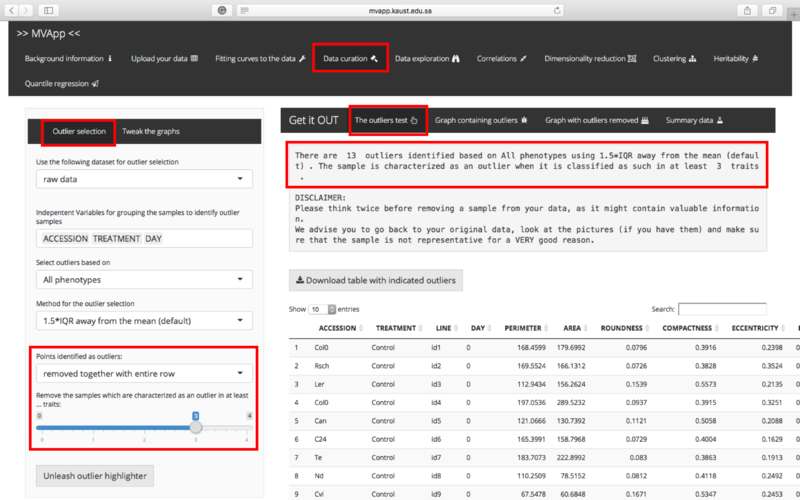 If you scroll even further down, you will find a table containing the cluster ID for your specific samples. 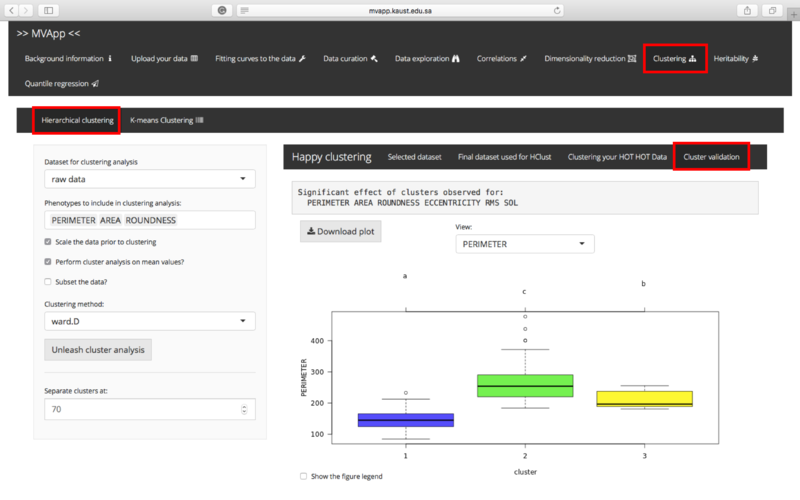 In the sub-tab “Cluster validation” you will find a message box displaying all the dependent variables for which ANOVA found significant effect of the clusters. 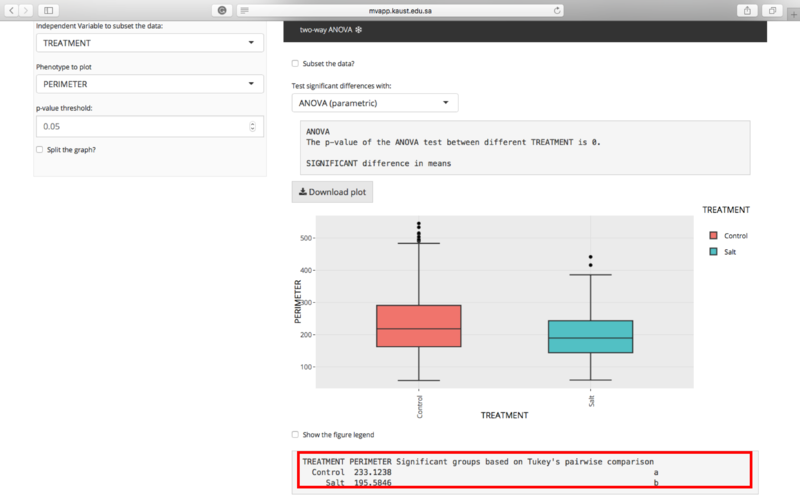 In the graph below the message box you can find a box-plot representing individual clusters and the letters above the graph display significant groups calculated using Tukey.HSD test for pairwise comparison. You can view individual dependent variables by selecting them from a drop-down menu “View” above the box-plot. K-means clustering is often used to find groups a data set, when categories or groups in the data are unknown. The K-means algorithm assigns the individuals to a number of centroids, defined by the user. The Euclidean distance between the individual and the cluster mean is computed and the individual is assigned to the closest centroid, so that the samples within the same cluster (K) are as similar as possible. This analysis is useful to confirm user’s hypotheses about the existance of possible groups or to detect unidentified groups in complex datasets. 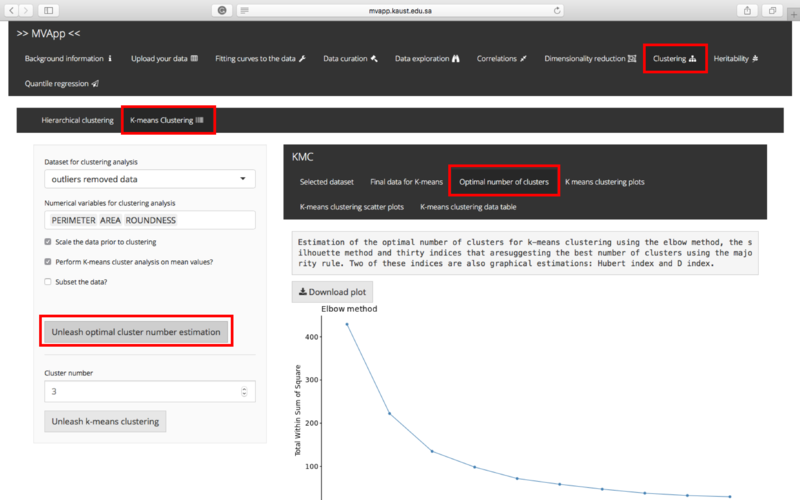 Subsequently, select which Dependent Variables you want to use in the K-means clustering. We recommend that you only include non-redundant, informative traits, which can be selected by visualizing the correlations between all traits. The use of highly correlated traits could increase the importance of these specific traits and skew the clustering. Thus, excluding redundant traits is advised. 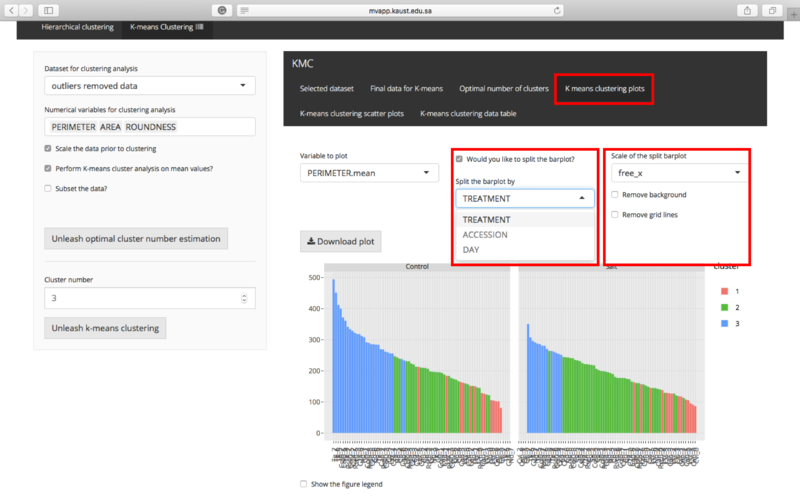 You can additionally select whether you would like to scale the data (recommended if the values of individual Dependent Variables are in different units), perform the K-means Clustering on the mean data (means are calculated per Genotype, Independent Variable and Time points selected in “Data upload” tab), or run K-means Clustering on a specific subset of your data. The number of clusters or centroids (K) must be defined by the user. 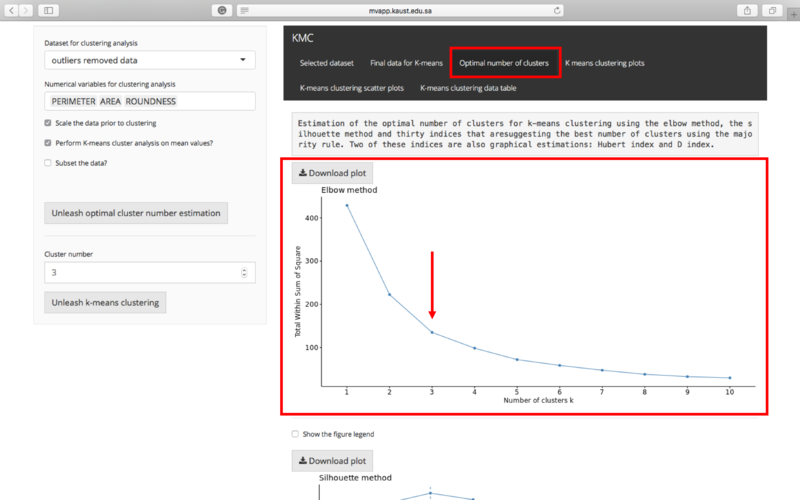 If you do not know what is the best number of clusters for your data, you can run a preliminary analysis in the sub-tab “Optimal number of clusters” by clicking “Unleash optimal cluster number estimation” button in the sidepanel. 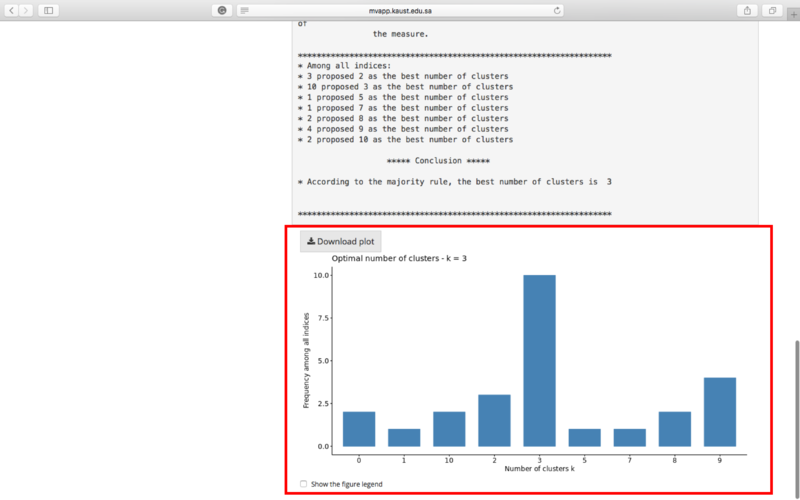 After the estimation step finishes running, the graphs will appear in the main windown in the sub-tab “Optimal number of clusters”. The graphs represent a graphical methods for cluster estimation. The first graph visualize the elbow method. You can identify the optimal number of clusters by identifying the point at which the line is making the sharpest turn, so called “elbow”. 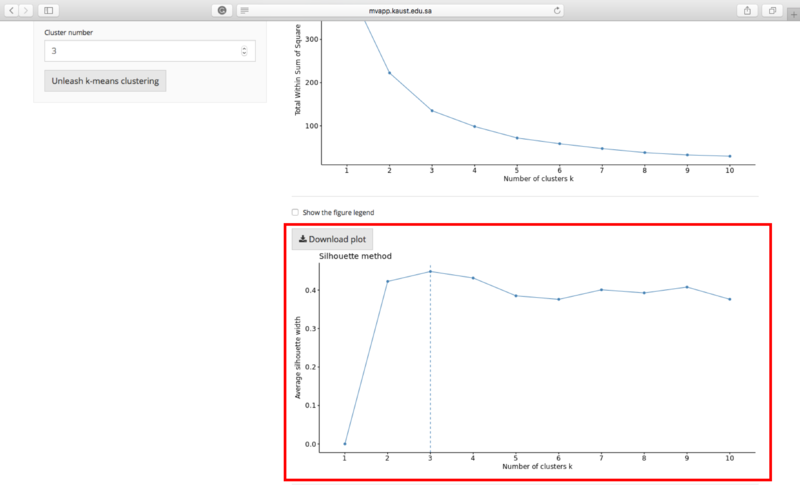 If you scroll down, you will see the graph representing the “silhouette method”, where the optimal number of clusters is indicated by dashed line. Scrolling even lower, you will find a message box displaying the results of the cummulative tests, using 30 different indeces, indicating the best cluster number according to the majority rule. 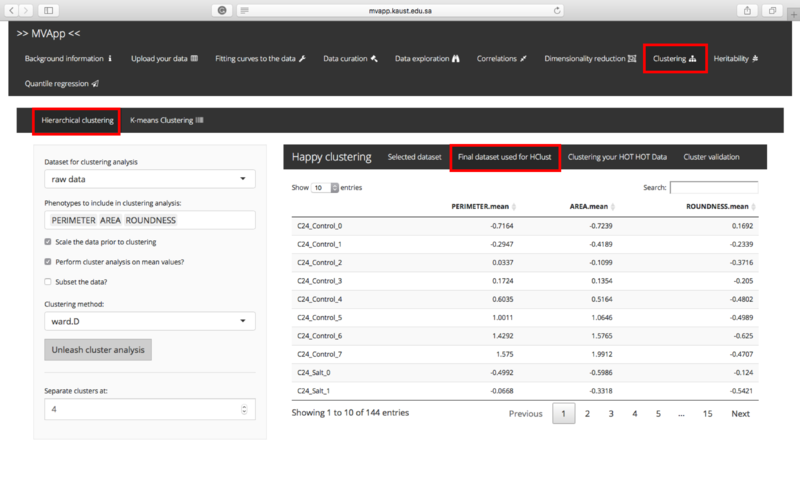 Below the message box, you will find the graphical representation of the cummulative cluster number indicated by different methods. Once you decided on the number of clusters to be used for k-means clustering, you should enter the cluster number in the “Cluster number” box and click “Unleash cluster analysis” on the side-panel. The results of the k-means clustering will be displayed in sub-tab “K-means clustering plots”, where you can view the individual samples plotted in the order of the selected Dependent Variable from the drop-down menu “Variable to plot” in the main window. The colors represent the individual clusters. 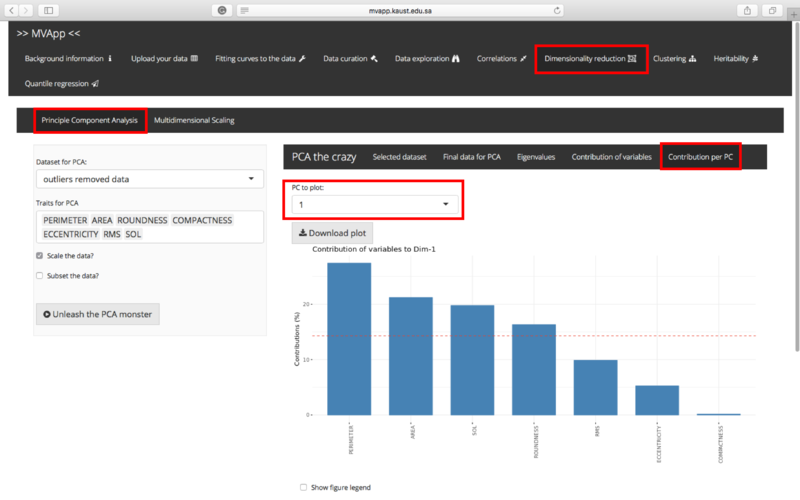 You can split the graph by selecting “Split the graph” checkbox and the Independent Variable to split by, as well as modify the appearance of the graph modifying the boxes on the right-hand side above the graph. 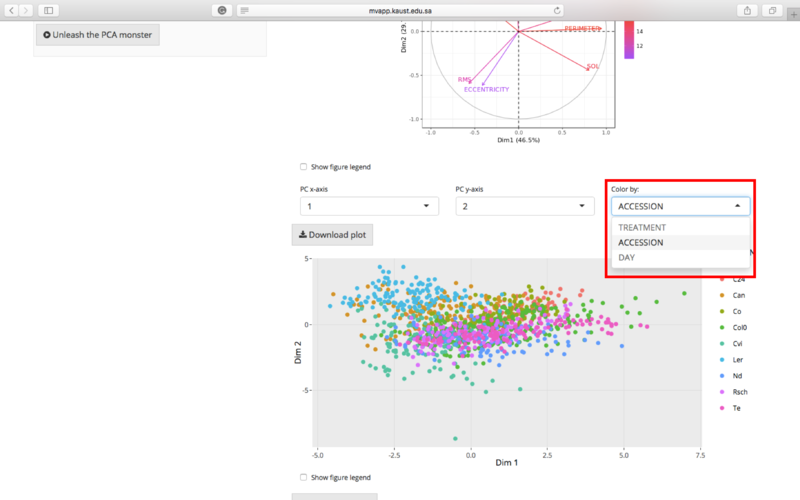 In the sub-tab “K-means clustering scatter plots”, you can plot the corelation between two selected Independent Variables, selected from the drop-down menus in the upper left corner above the plot. You can split the graph by selecting “Split the graph” checkbox and the Independent Variable to split by, as well as modify the appearance of the graph modifying the boxes on the righ-hand side above the graph. 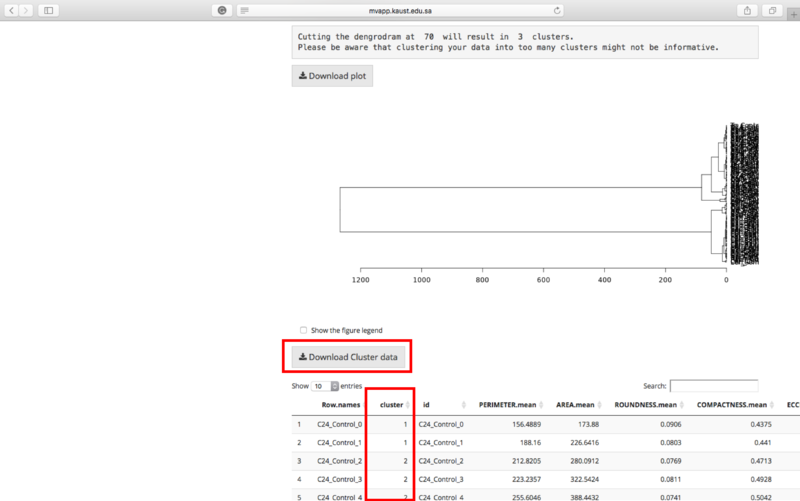 Finally, in the sub-tab “K-means clustering data table” you can view the table and which of your samples belong to which clusters. The columns with cluster identity is all the way at the right side end of the table. 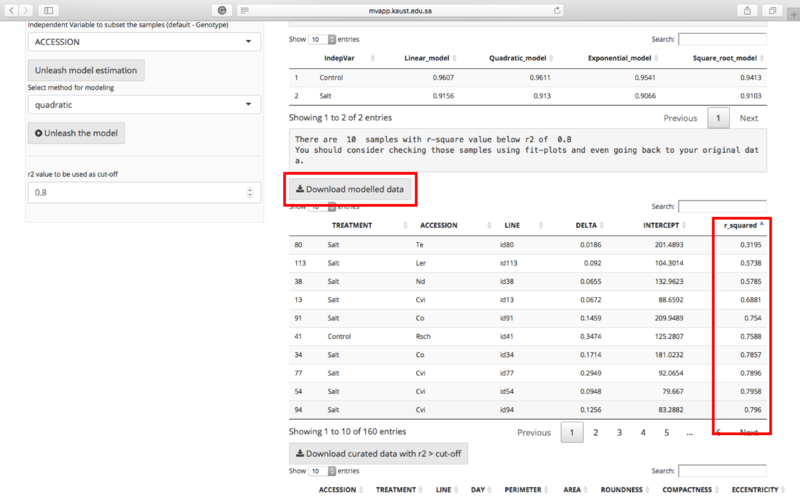 You can download the table as a “.csv” file by clicking on the button “Download data”. Heritability is the proportion of the phenotypic variance that can be attributed to genetic variance. This statistic is important in the fields of genetics in order to assess if a trait is heritable (genetically controlled). 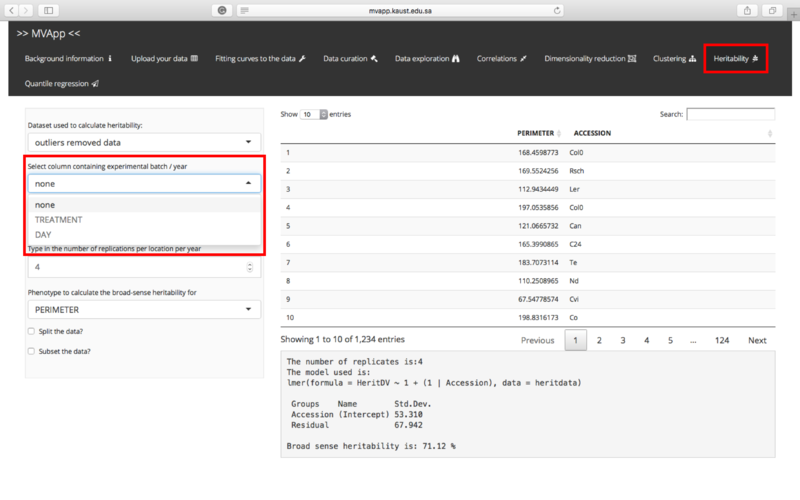 MVapp allows you to calculate the broad-sense heritability, which is the ratio of total genetic variance to total phenotypic variance. NOTE! Please, be aware that in order to estimate heritability, you should have at least 5 different genotypes. If you performed your experiment across different years or experimental batches, please select the column indicating the year / experimental batch from the drop-down menu “Select column containing experimental batch / year”. If you do not have this information, or your data was collected from one experiment, select “none”. The model will still be able to run. 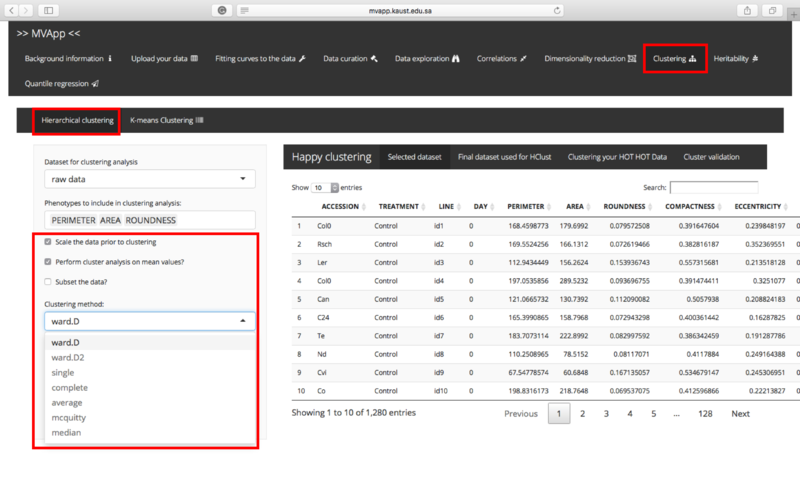 The same applies for the drop-down menu “Select column containing location”. Subsequently, enter the number of the replications per location and per year. 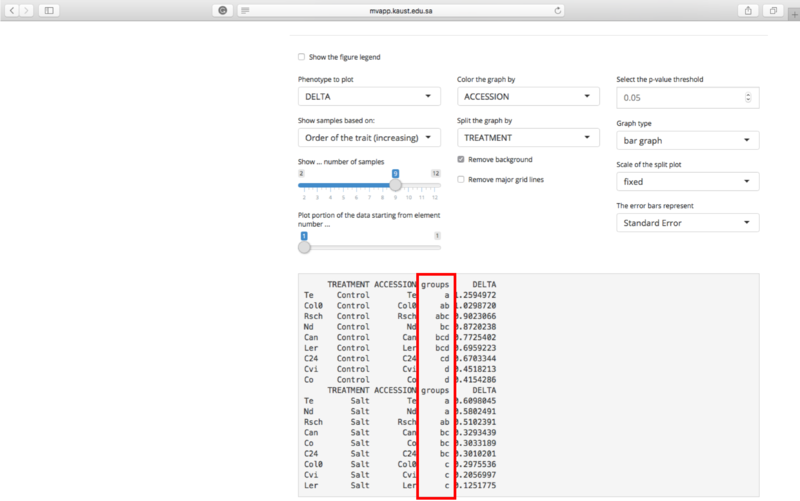 If your data contains different treatments, you can split your data by selecting “Split the data?” checkbox and selecting an Independent Variable from the drop-down menu for which you wish to split. In the main window, the message box will give a summary of information entered (number of replications, number of years/locations and unique values per year/location) and the summary of the model used to calculate heritability. 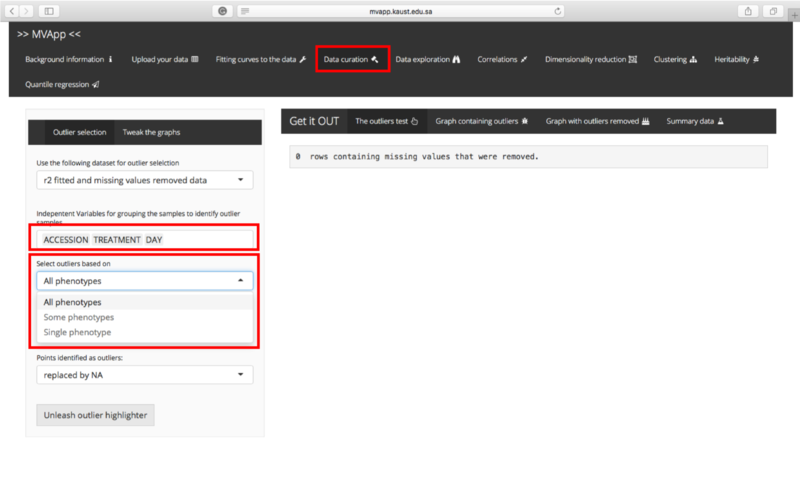 In case you wish to subset your data even further, you can do it by selecting “Subset the data?” checkbox and selecting an Independent Variable from the drop-down menu for which you wish to subset, as well as specific subset to be displayed. As soon as you do that, the estimated broad-sense heritability values will adjust. Quantile regression is a way to estimate the conditional quantiles of a response variable distribution in the linear model that provides a complete view of possible causal relationships between variables. 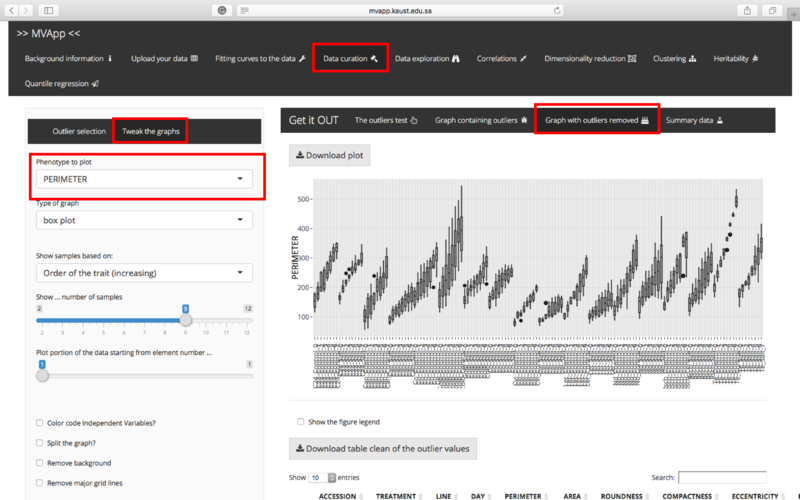 Quantile regression minimizes absolute errors and can provide a more comprehensive analysis of the effect of the predictors on the response variable than mean regression. Linear quantile regression is related to linear least-squares regression as both try to study the relationship between the predictor variables and the response variable, the only difference being that least-squares involves modeling the conditional mean of the response variable, whereas, quantile regression models the conditional quantile of response. It is especially useful in applications where extremes are important, such as environmental studies where upper quantiles of yield are critical. Quantile regression estimates are more robust against outliers in the response, so if your response variable has potential outliers or extreme data, then ordinary least squares (OLS) regression is more effected as mean is more effected by outliers, you can use median regression as a substitute. 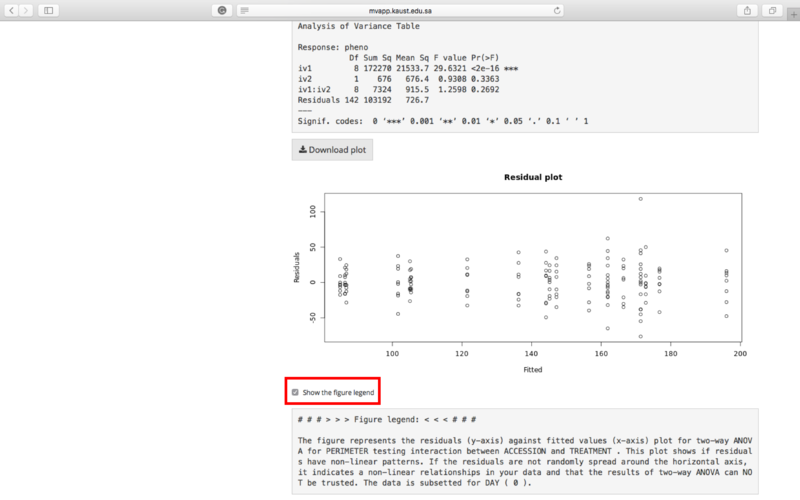 If your errors are non-normal then OLS is inefficient, but quantile regression is robust. If your data fails to satisfy the assumption of homoscedatcity of the error terms, then you can use this technique, as there is no such assumption required here. Beyond that, quantile regression also provides a richer characterization of the data, allowing us to consider the impact of an explantory variable on the entire distribution of response, not merely its conditional mean. Select which dataset you would like to use to perform quantile regression from the drop-down menu at the top of the side panel. If you did not perform outlier removal or curve fitting, the “outliers removed” and “r2 fitted curves curated data” will not work properly, so please do not select them. 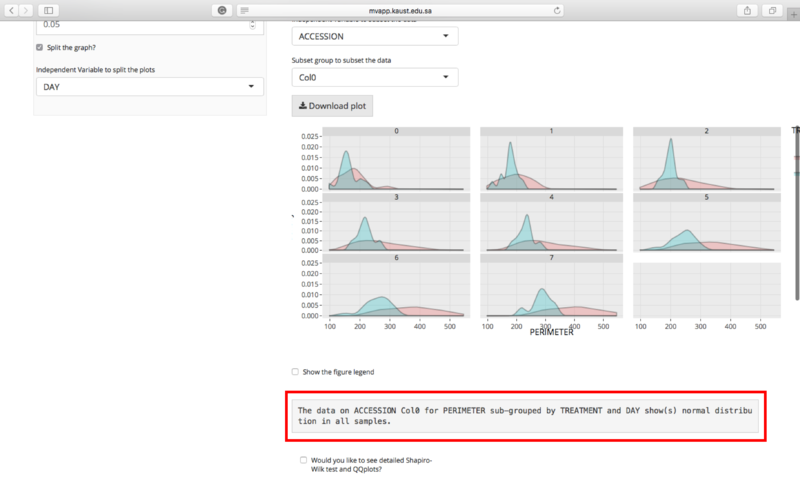 Select the phenotype you want as response of your quantile regression, you can only choose one variable. 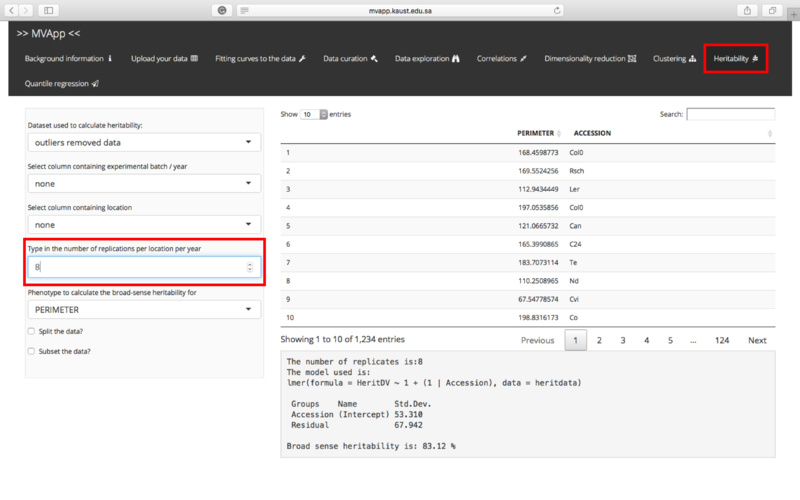 Select the independent varaibles to subset the data, you can choose a maximum of two variables. Then choose the explanatory variables of your quantile regression model, you can choose any number of explanatory variables. 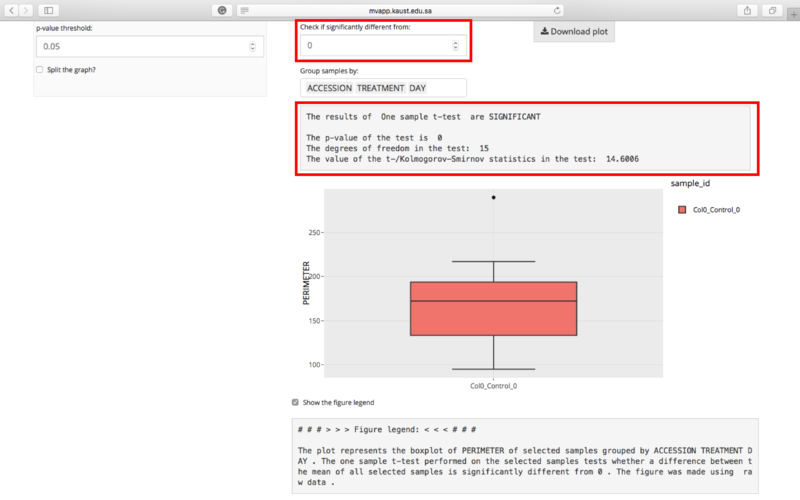 You can also choose a p-value threshold to test the significance of the explantory variables. You have the option to scale the data which might be useful if your variables are in different units. After you select all of the neccessary parameters you can click on “Unleash the power of Quantile Regression” button. The selected dataset will be displayed in “Selected Dataset” sub-tab in the main window. 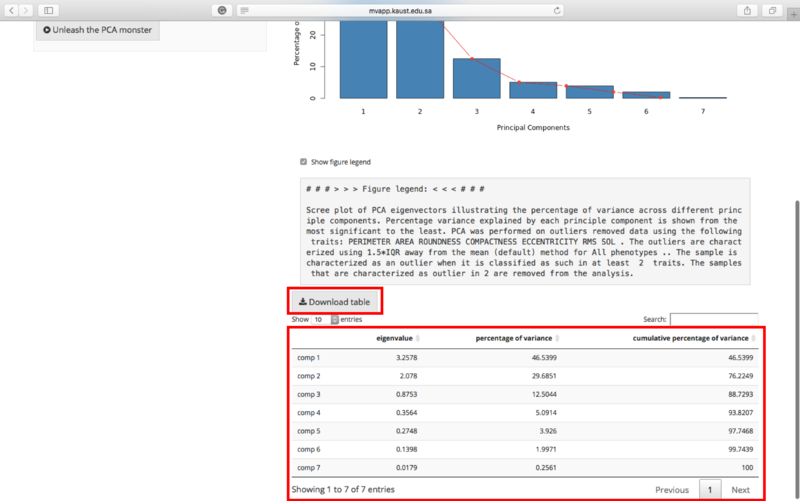 The specific subset, selected for the quantile regression with / without scaling is displayed in “Final data for analysis” sub-tab. 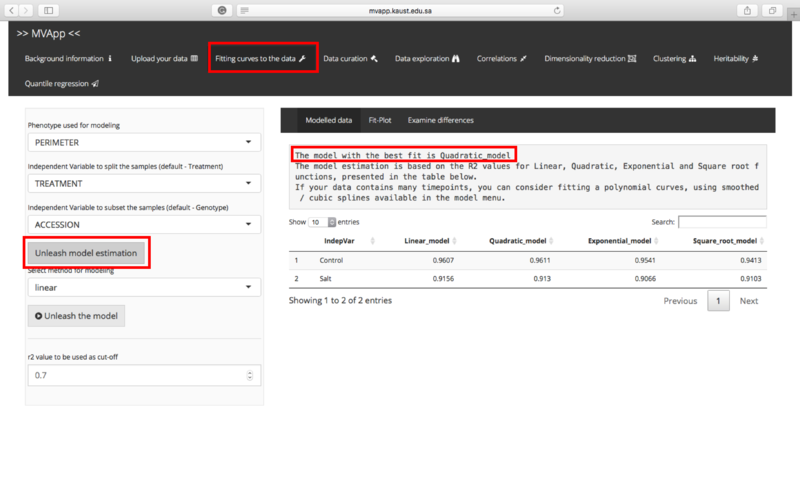 The result of the quantile regression model can be seen in the sub-tab ‘Modelled data’. You can chose a specific subset to view from the drop-down menu “Use subset” above the message box. The message box displays the significant phenotypes for lower, median and upper quantiles of the response for the particular subset chosen from the drop down list. You can choose the subset whose result you want to see in the message box. The results from all the quantile regression models for different subsets are tabulated. 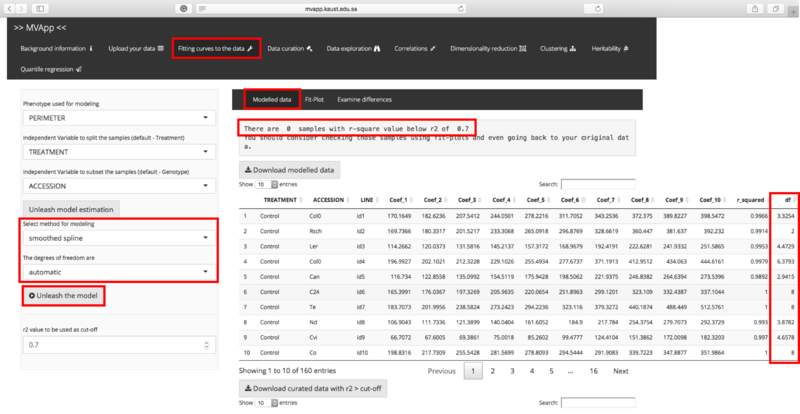 The table can be downloaded as a “.csv” file by clicking the button “Download modelled data” containing all the results. 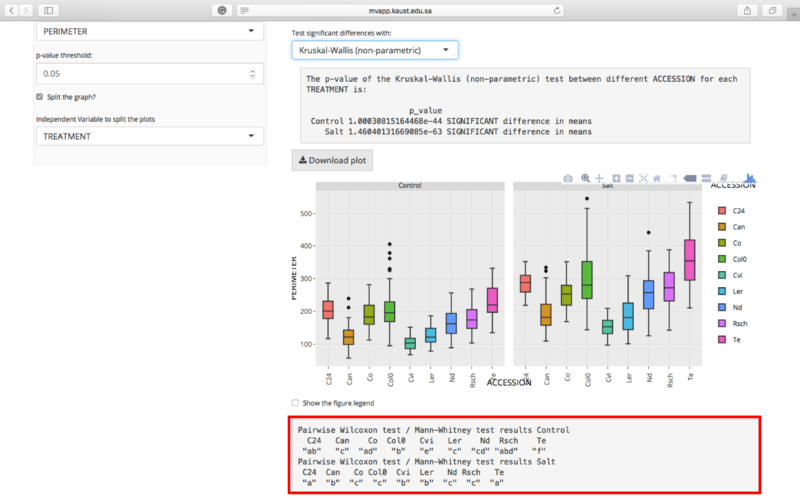 The plots of the regression models are displayed in the sub-tab ‘Quantile plots’. 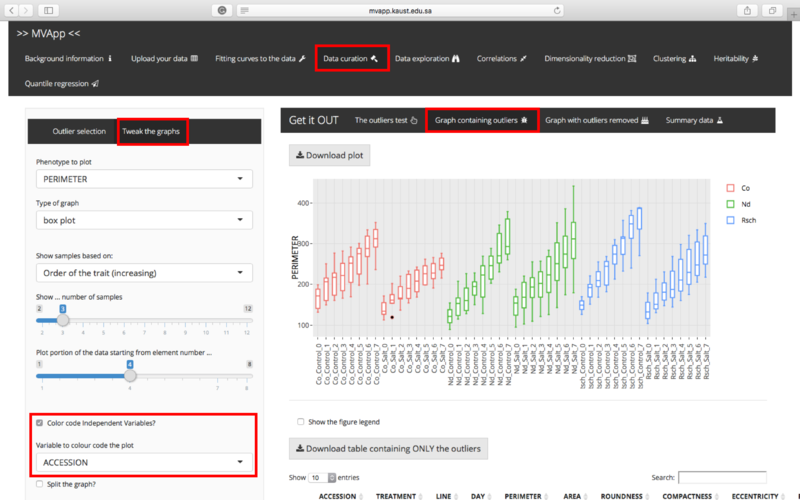 You can choose the independent variable by which you want to group your plot. 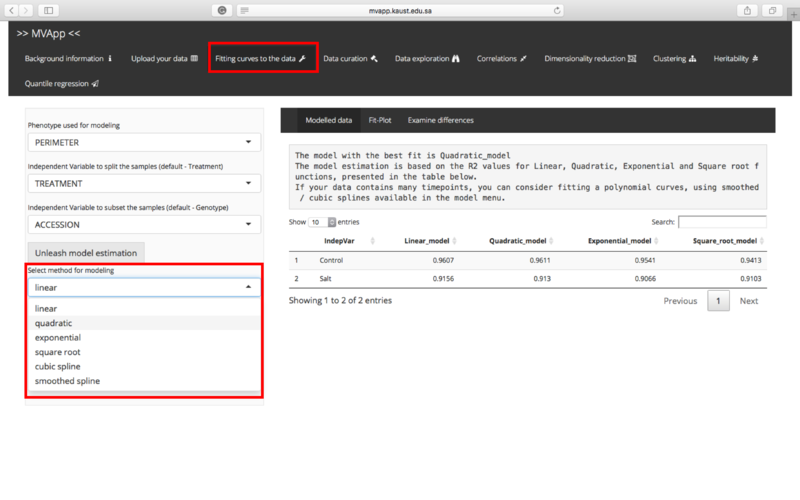 If you have chosen two independent variables to subset your data, then you can also choose the value of your another subset variable whose result you want to see. 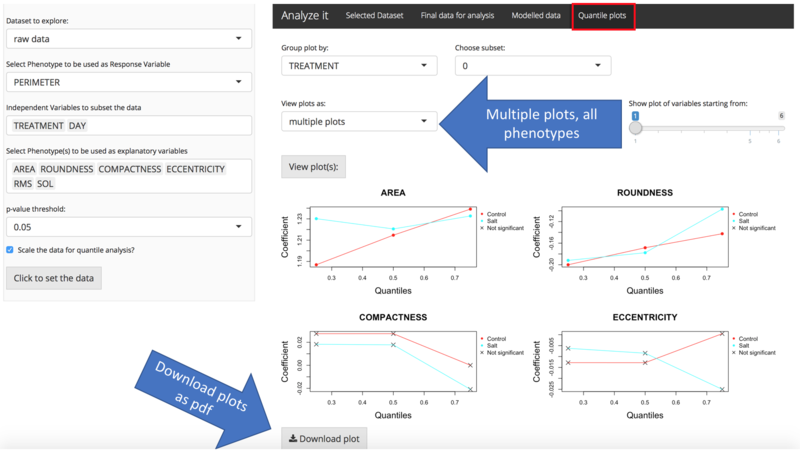 If you view a single plot, then choose the particular phenotype you want to view. The coefficients of the phenotype are plotted against the quantile level. The colored dots represent that the variable is significant for the particular quantile level and the cross sign represent that it is not significant. The different colors represent the different unique realizations of the grouping variable. The different lines can be used to compare the behavior of phenotypes in different conditions or different days, depending on the grouping variable. 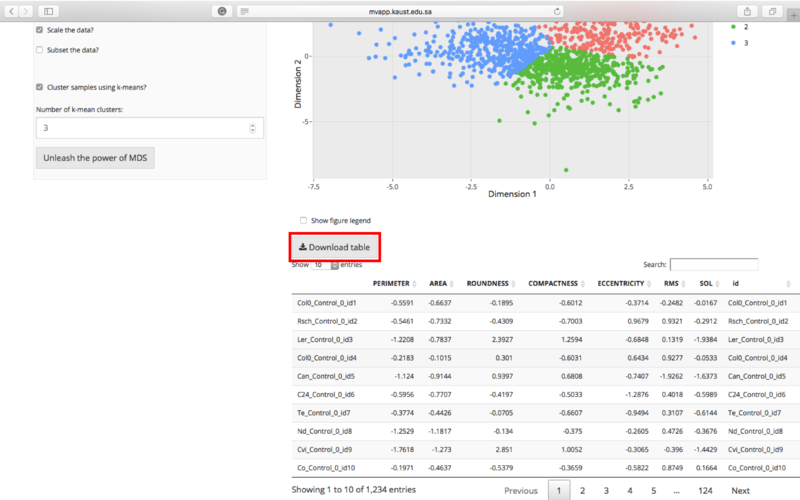 The plot can be downloade by using the “Download plot” button above the plots. 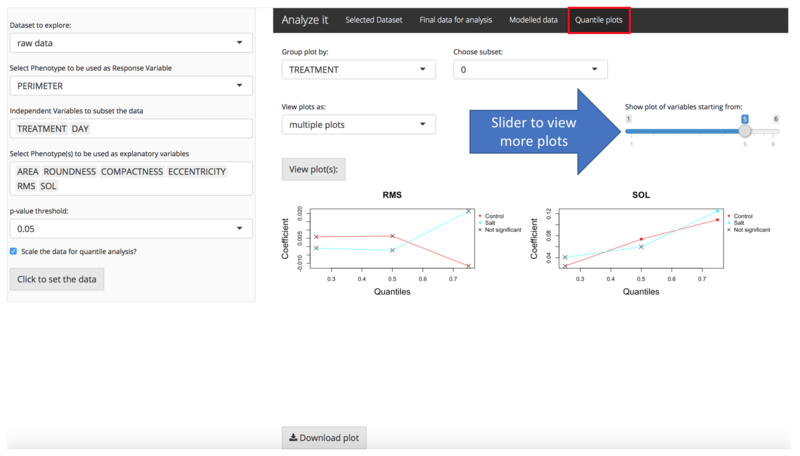 If you want to view the results of all your phenotypes the you can choose ‘multiple plots’ from “View plots as:”. The panel displaying the plots will update automatically. 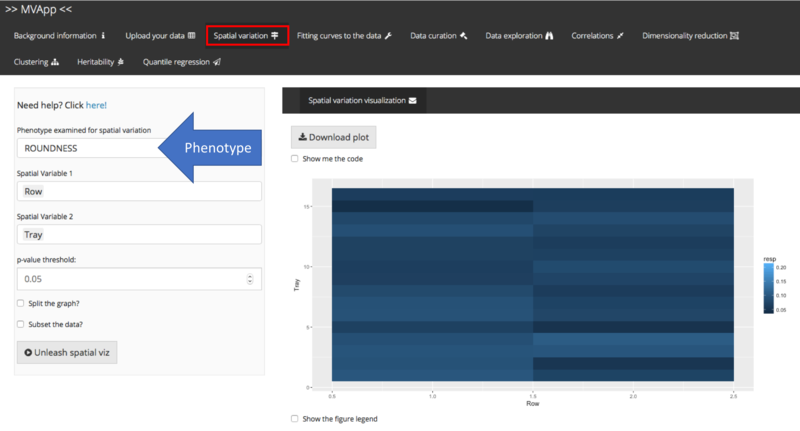 If you choose to view your plot as single plot, the quantile plot of the phenotype chosen will be displayed. The coefficients of the phenotype are plotted against the quantile level. The colored dots represent that the variable is significant for the particular quantile level and the cross sign represent that it is not significant. The different colors represent the different unique realizations of the grouping variable. The different lines can be used to compare the behavior of phenotypes in different conditions or different days, depending on the grouping variable. The plot can be downloade by using the “Download plot” button at the bottom. 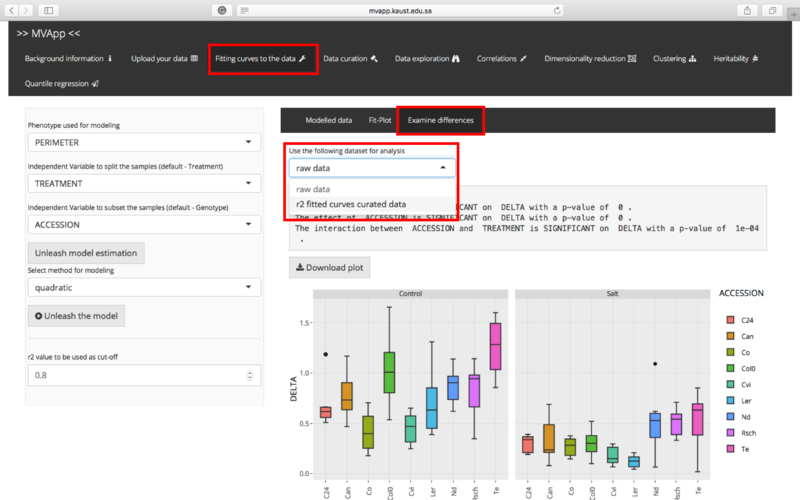 If you choose to view your plots as multiple plots, the quantile plots of all the phenotypes will be displayed. 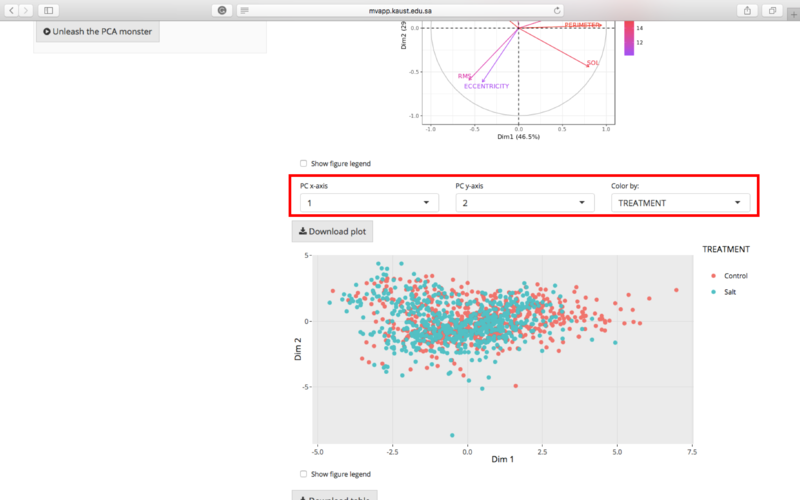 You can download these plots using the “Download plot” button at the bottom. If you have more than four explanatory variables, then you can use the slider to view more plots. MVApp is maintained by mmjulkowska. This page was generated by GitHub Pages.